I am now back in the U.S. and two weeks into classes at Boston College. 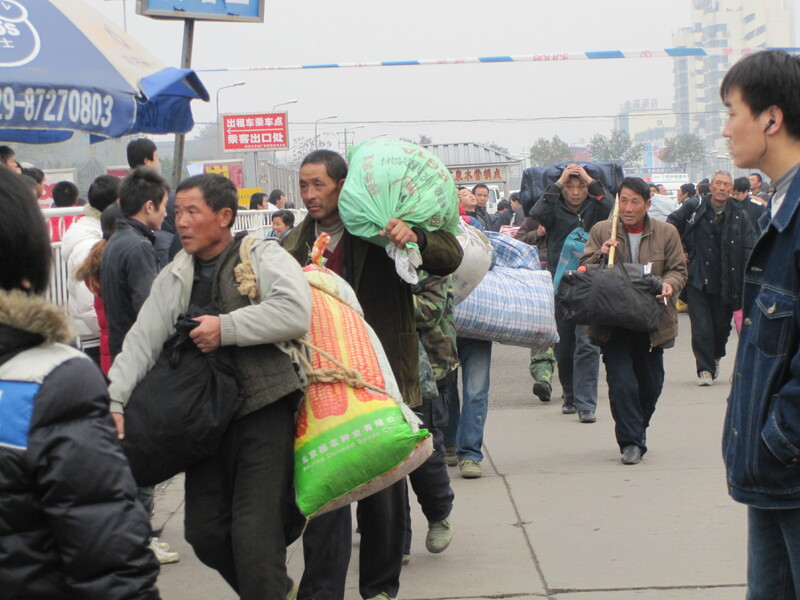 After returning from China my life was a whirl wind. The culture shock surprisingly didn’t hit me too hard initially because I was just too busy to realize. I had to unpack, meet with tons of people (friends and family) and summarize my experience hundreds of times. The first sign that I was back home—back to familiarity—was my first meal. The night I got home, my family had one of my favorite home-cooked meals: pork, stuffing, mashed potatoes, and pop-overs. I showed everyone pictures and told stories though most of my family had a good idea of what I had been doing by keeping up with my blog. Within just days of unpacking my countless souvenirs and four months worth of clothes, I had to start packing to move into my off-campus house at Boston College. 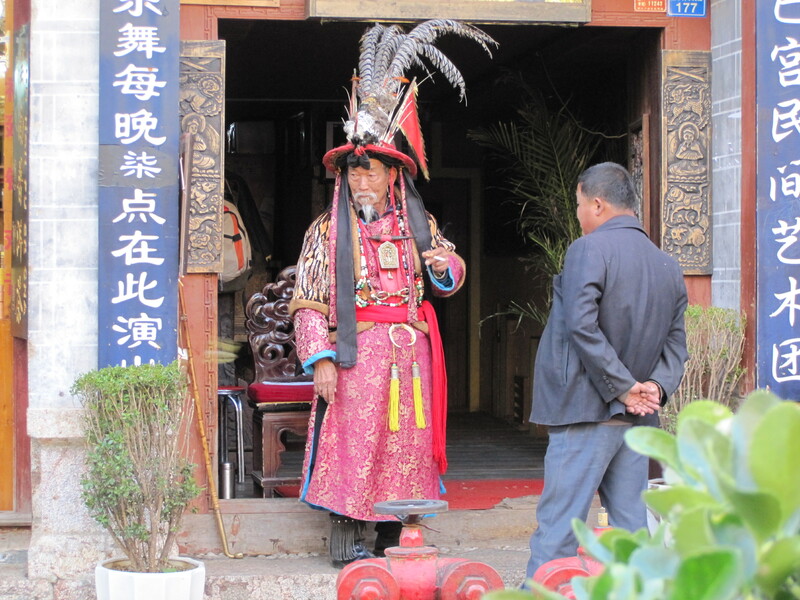 While it was definitely strange being back—for one: seeing people in the streets whose hair color was something other than black—I didn’t fully realize how accustomed I had become to the Chinese culture. 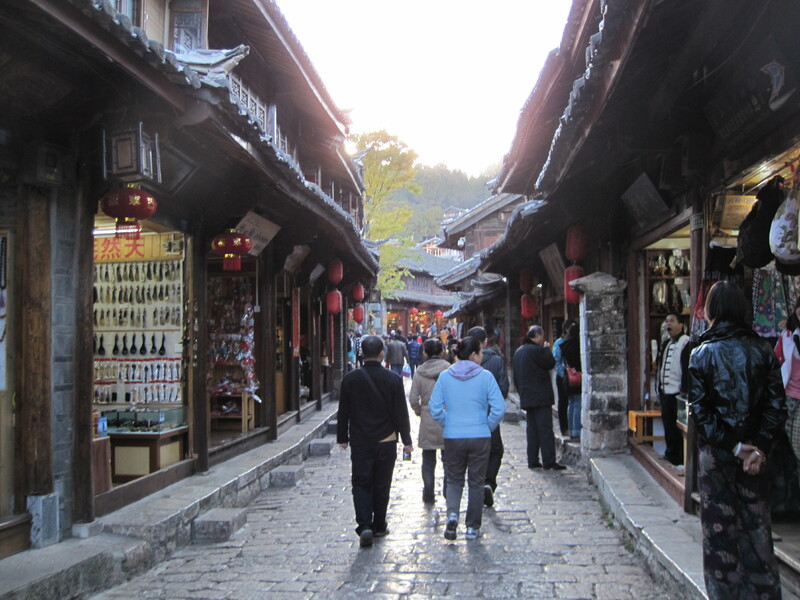 It was a relief to be able to speak English with any and everyone, and to know that no matter where I was, I could always ask for directions—a luxury I didn’t have while in China. After moving back to school I was again bombarded by the distracting effects of “new” in my life. It was exciting being back at Boston College, a sentiment which was only amplified by living in a huge house with 14 friends. Seeing familiar faces (despite that 40% of my class goes abroad in the spring) and landmarks was the most satisfying part. For the first few weeks, the adjustment was so drastic that I didn’t really have time to really reflect on my experiences and what they meant for me. It wasn’t till I really settled back into the routine of classes and life at school in general, that I realized how much I had changed. 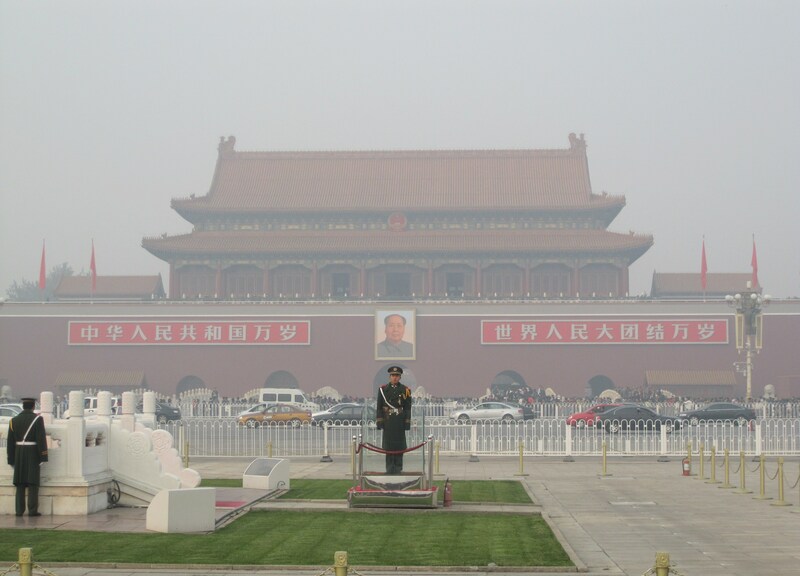 If I had to sum up the fundamental difference between me before and after living in China in one word, it would simply be: Perspective. The perspective I had developed throughout my life—growing up in a small town in northeastern Massachusetts etc—was totally blown out the window in a way that is hard to describe. 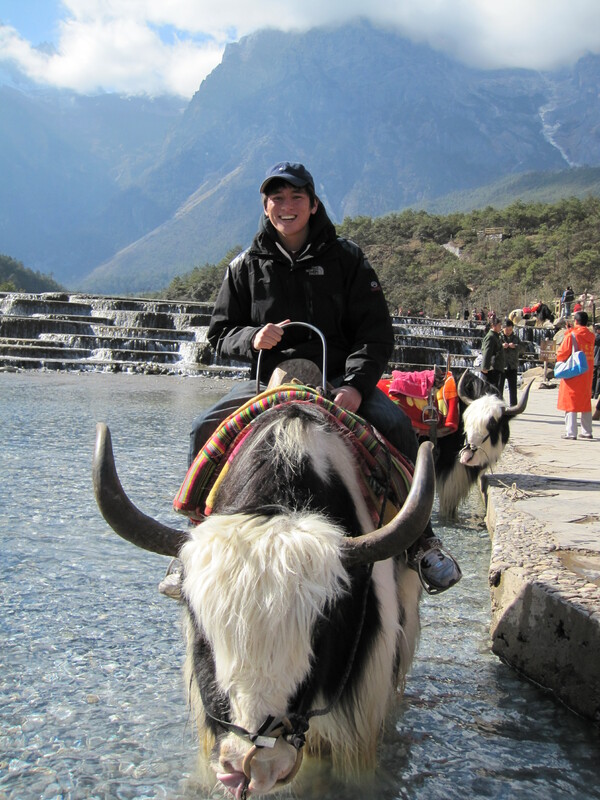 I have had an extremely fortunate childhood with the opportunity to travel all around the world—China, Thailand, London, Paris, Florence, the Caribbean—but while those experiences did each individually and collectively expand my perspective of the world, none of them were comparable to actually living abroad for an extended period of time. As I had been told (and soon realized to be accurate), the first month or so of the study abroad experience feels like a vacation in that everything is exciting and new. After this “honeymoon” period, the experience becomes something other than merely a vacation or fleeting visit. 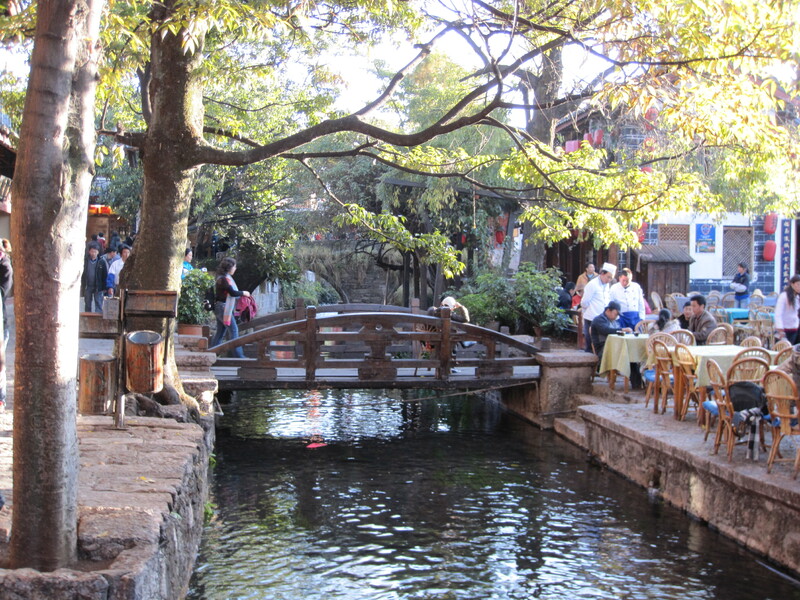 You start to relate to the people, the culture, and life in that country not from the eyes of a tourist passing through, but progressively from the eyes of those around you—the citizens who were born and raised there. That is the perspective which is unattainable without actually living in another country, and a perspective which I have come to appreciate and understand more fully as I settle back into life here back at home. Another important realization, more particular to me, was the opportunity to glimpse what life may be like for me after college. 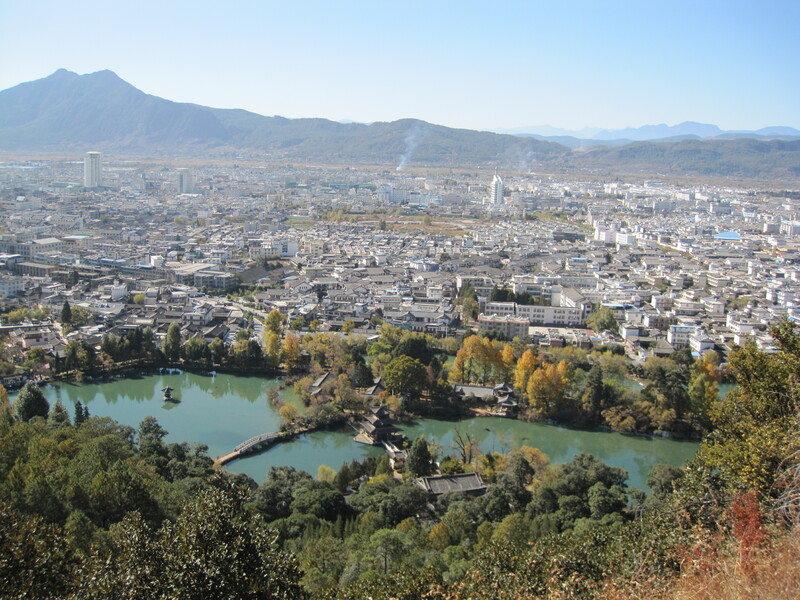 During my four months in China I was so excited by the people I was meeting, the ideas I was encountering, and the contagious excitement that inevitably surrounds those living in Beijing, China, (due to the unprecedented economic opportunity) that I grew accustomed to the idea that I would live and work there after college. In a lot of ways, the experience was a “test-run” of sorts, and in those months my mindset was constantly focused on my future aspirations abroad as I habitually ended an intriguing conversation with a newfound friend with, “I’ll be here in another year and a half.” I didn’t fully appreciate the consequences of that state of mind until returning—both positive and negative. The negative aspect was that I was focusing too heavily on the future and upon returning to college, I realized that I was both excited and relieved to be just a junior in college again, along with the simplicities that affords. 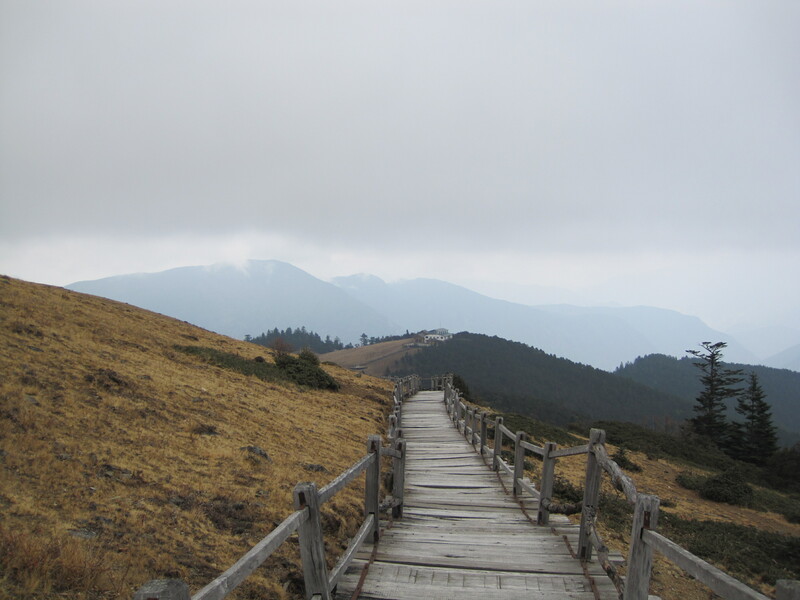 I did, however, come away with a newfound clarity in both what I wanted for myself, and how my life and actions today could align to that eventual goal of working and succeeding in China. In a sense, the opportunity to live away from my life as I knew it made my future aspirations more apparent to me. As I came back to my life back at Boston College, that clarity gave direction and more meaning to what I was doing now. 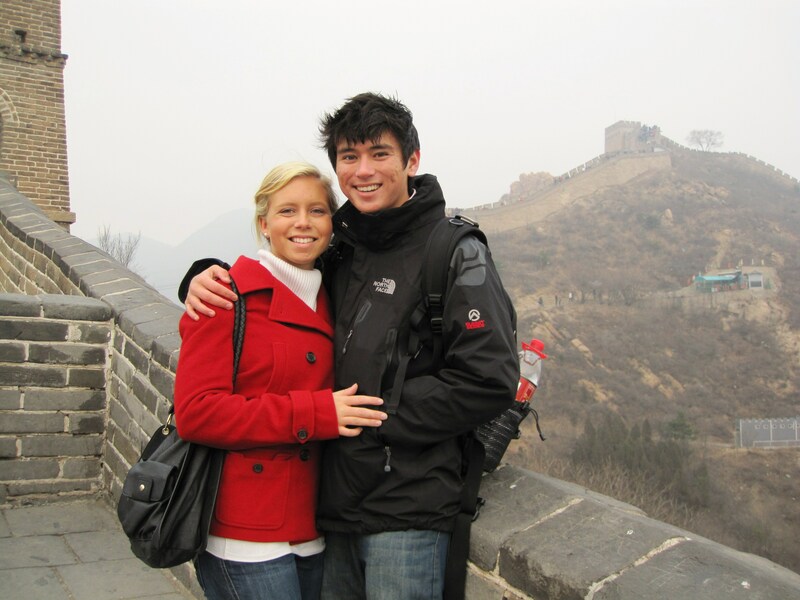 The months abroad definitely weren’t always easy–I remember how hard it was adjusting to the food, being away from my girlfriend, friends, and family, and seemingly being out of place in every way—but it was undoubtedly one of the most rewarding and meaningful experiences I have ever had. 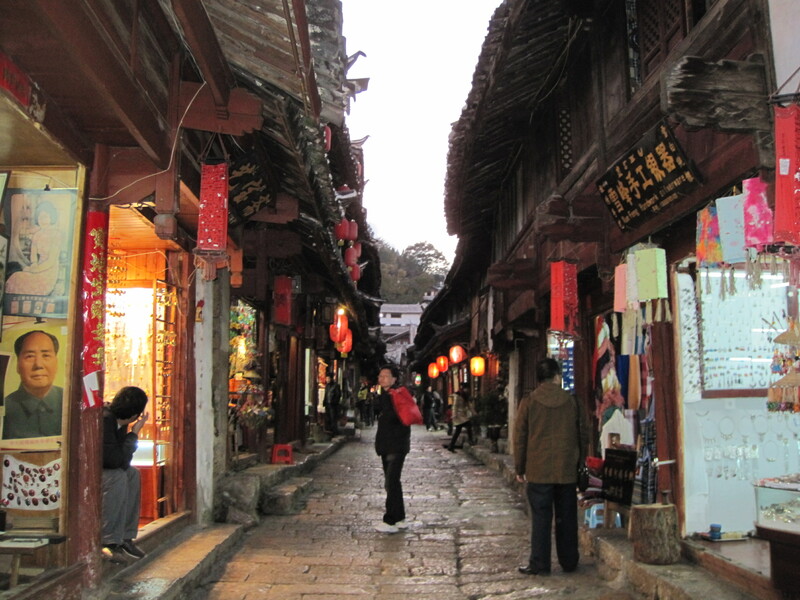 China, in particular, was not a typical study abroad experience in any way. I talked with friends who went to Australia and Europe, who had an amazing time going out partying and going on what seemed like an extended spring break. While I am in no way discrediting other programs, I definitely do not regret taking the more unusual path; a path that, though hard at times, has made all the difference. 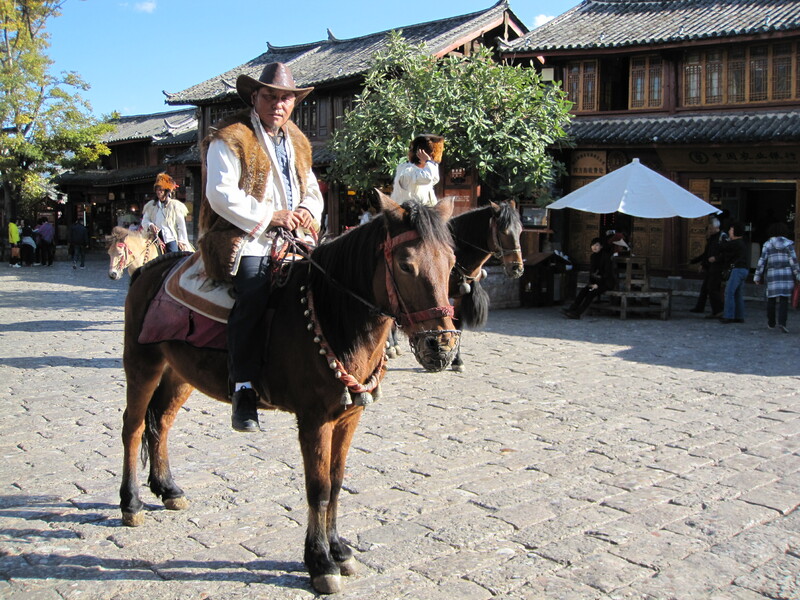 In Lijiang we stayed for five whole days and went on a number of excursions including to the nearby Dark Dragon Park, the Yulong Mountain where I rode a Yak, a rural Chinese village near Shigu (along the Yangtze River), and the world’s deepest river canyon—Tiger Leaping Gorge. 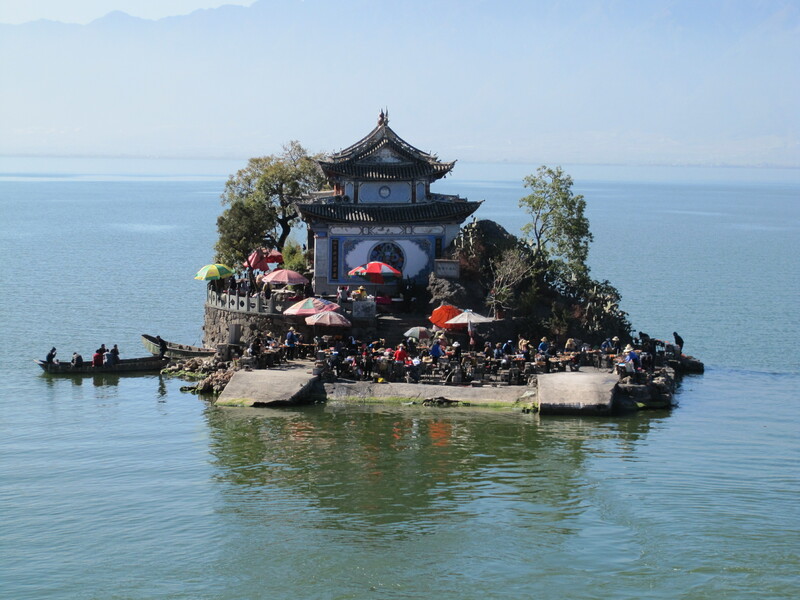 After an amazing time in Lijiang we took a bus to Dali where we went on a cruise on Erhai Lake. 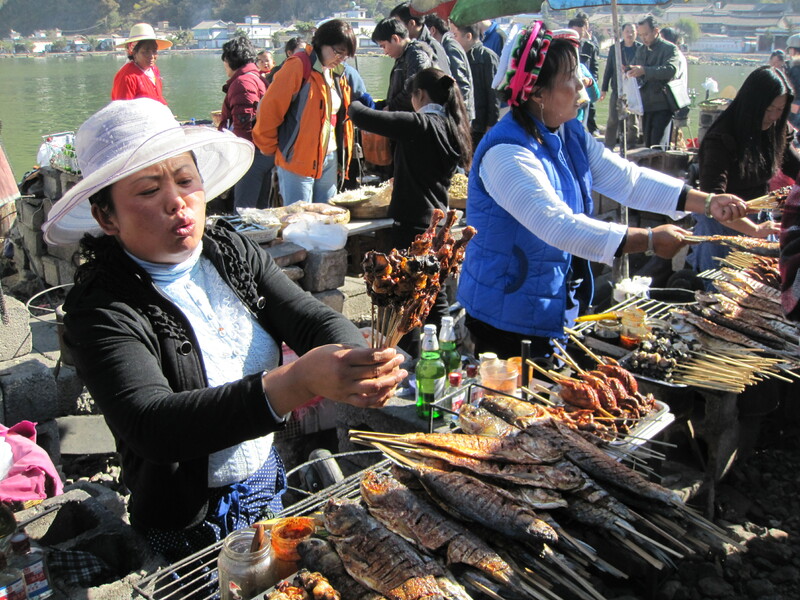 We stopped at a few islands in the lake, one of which was packed full of vendors who were frying fish and shrimp and all shorts of sea creatures alive—right in front of us. 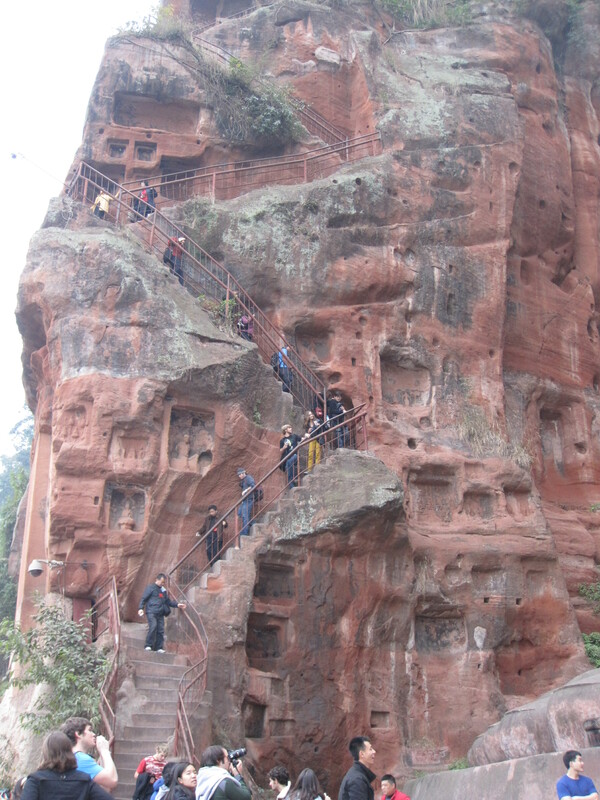 From Dali we drove to Kunming by bus where we would leave the next day back for Beijing. On the way, we stopped at a rest stop for some food and a bathroom break. I, like everyone else, was exhausted but I managed to shop around the make-shift food market to buy one of my favorite Chinese foods—包子—dumplings. Shortly after eating them, I didn’t feel that great but assumed it was because I was tired. I soon realized, that was not the case. 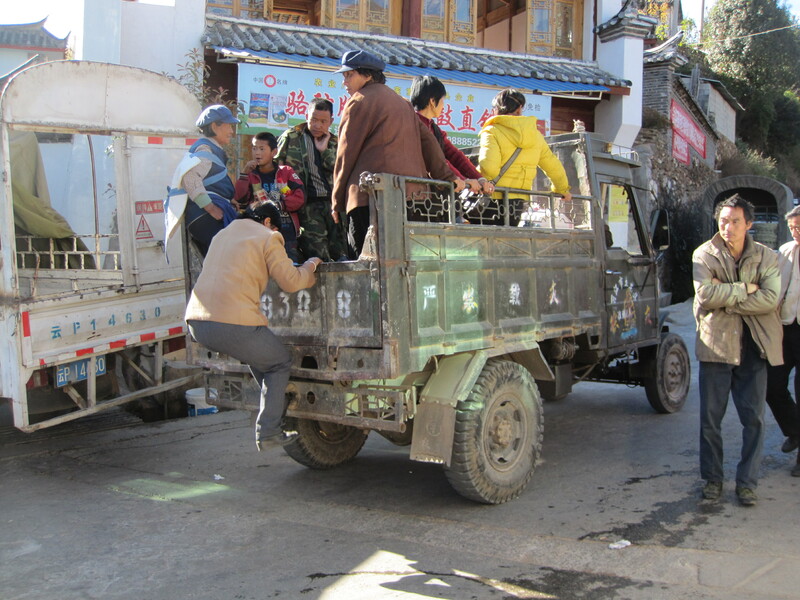 Luckily we arrived in Kunming before I, along with 8 other kids on the bus, started getting really sick. 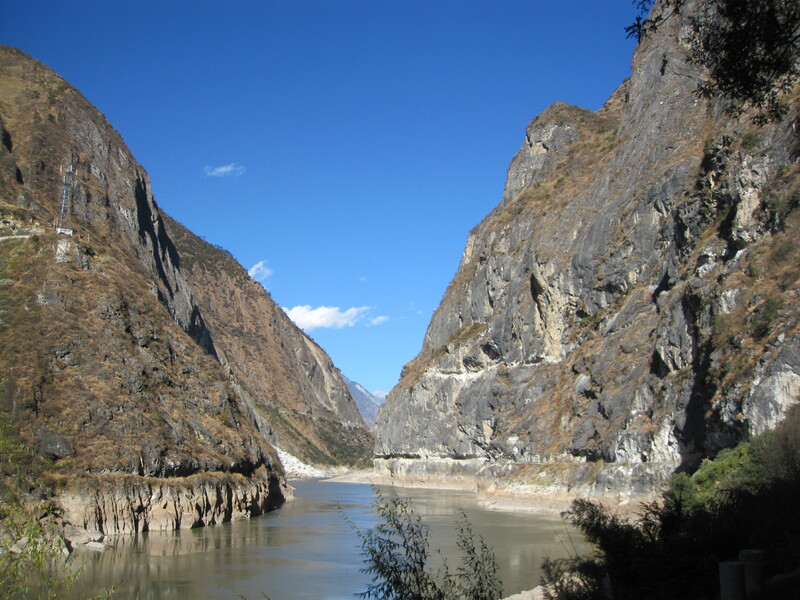 I had always been told that everyone gets sick while traveling in China but I was one of the lucky few who had avoided the inevitable for over three months. Of course, on the very last day of the entire program…I got sick. 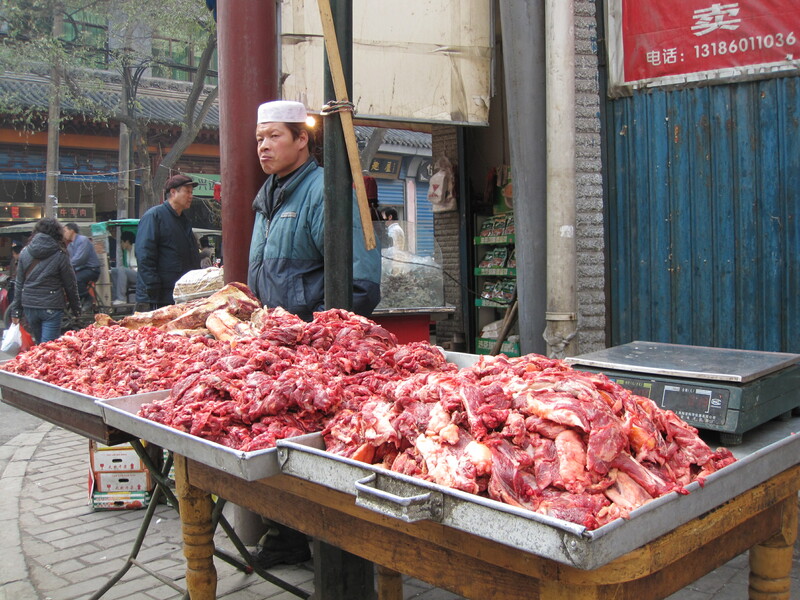 There is not much to say other than getting food poisoning in China—assuming that is what it was—was one of the worst experiences in my recent memory. 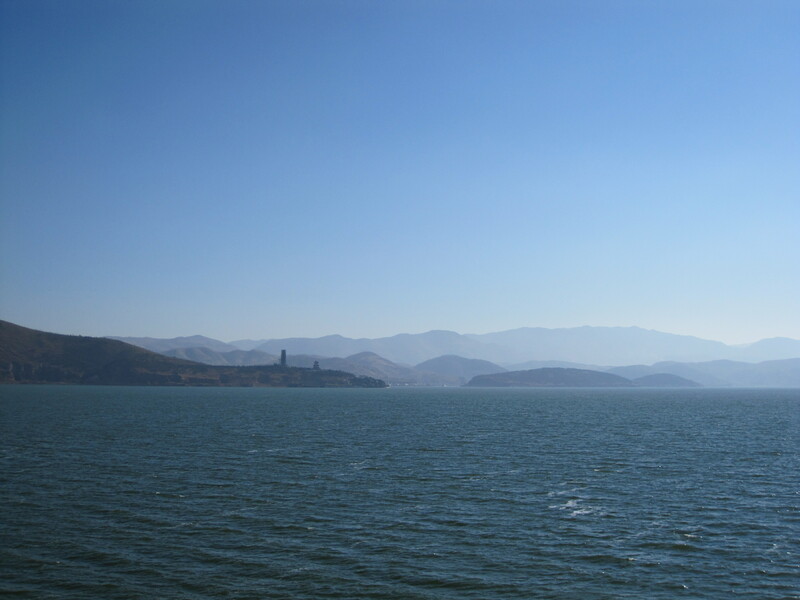 Needless to say, I was in bed for the remaining day in Kunming and therefore didn’t get to see much of that city before we left the next day on a flight back to Beijing. 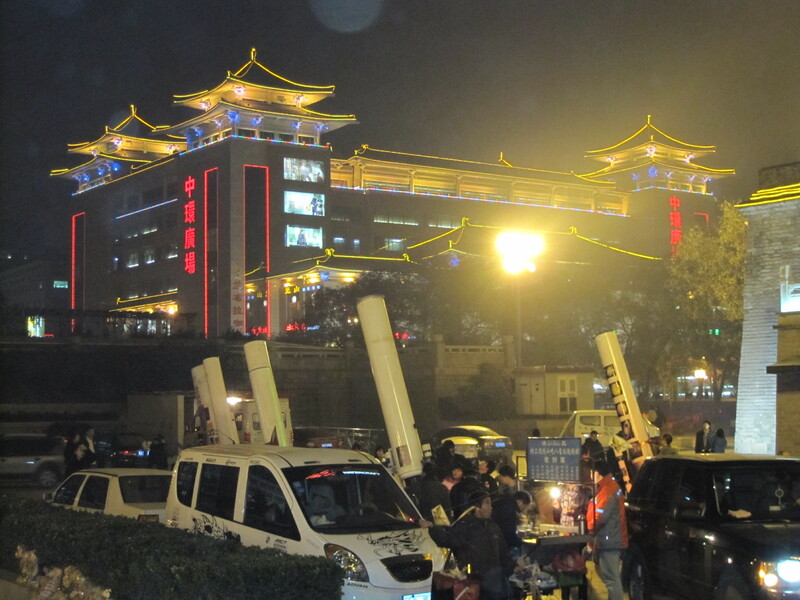 Back in Beijing we had a final banquet with the entire program reunited from the three disparate trips. The mood was bitter sweet as everyone was sad that the program had ended and new friends had to part ways but simultaneously excited to go home. 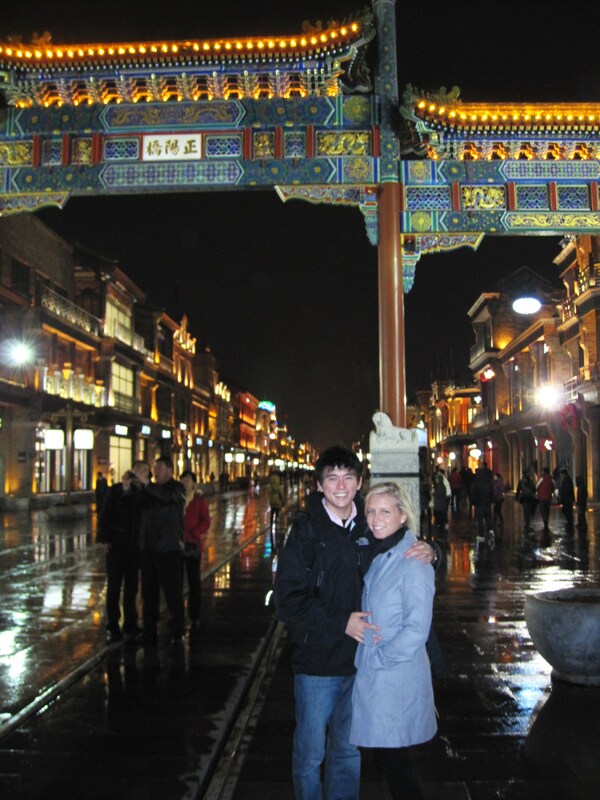 That night we all went out to celebrate, one last time in Beijing. In the morning after many hugs, contact information, and last goodbye’s were exchanged, we all went to the airport and parted ways. 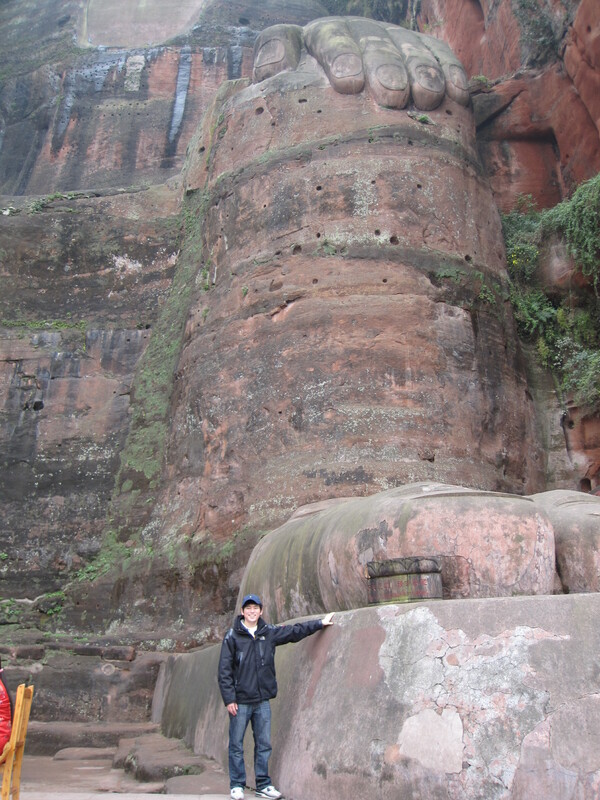 The next day we went to the nearby city of Leshan to see the largest stone carved Buddha in the world. The story behind its creation is equally as extreme as its physical dimensions: towering 71 meters (233 ft) in the air with shoulders 28 meters wide. 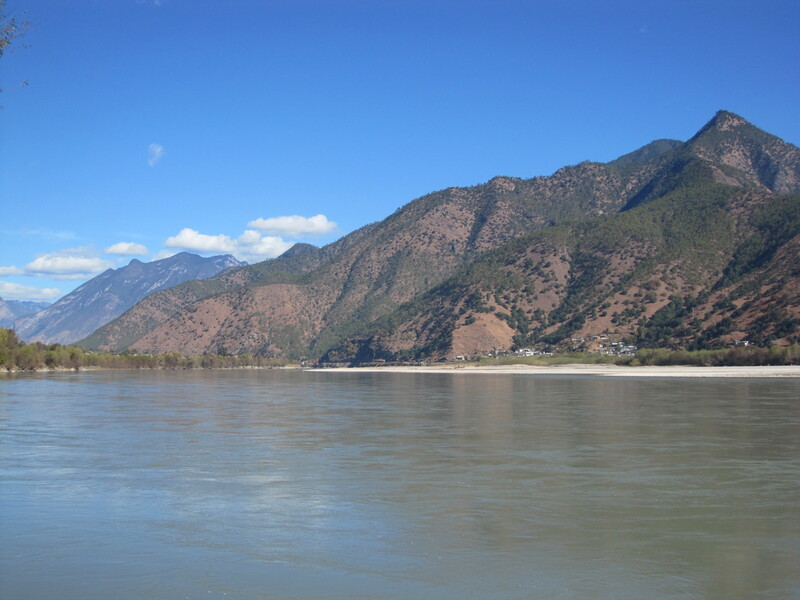 A Chinese monk, Haithong, started the construction in 713 in hopes that the Buddha would calm the river’s characteristically turbulent waters which resulted in the destruction of many ships every year. He raised the funds necessary for the project and, legend has it, when local authorities threatened to take the money away he gauged his own eyes to show his piety and determination. 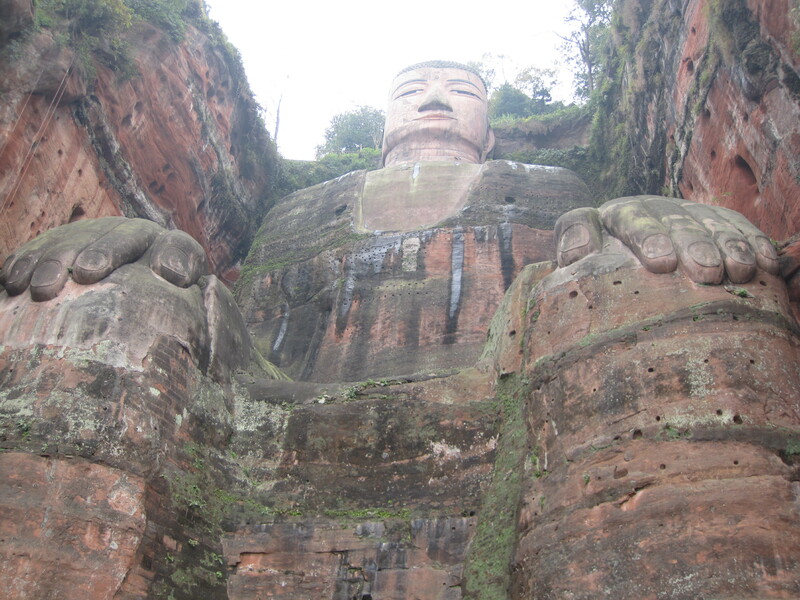 They never bothered him, or the construction of the Buddha, again. 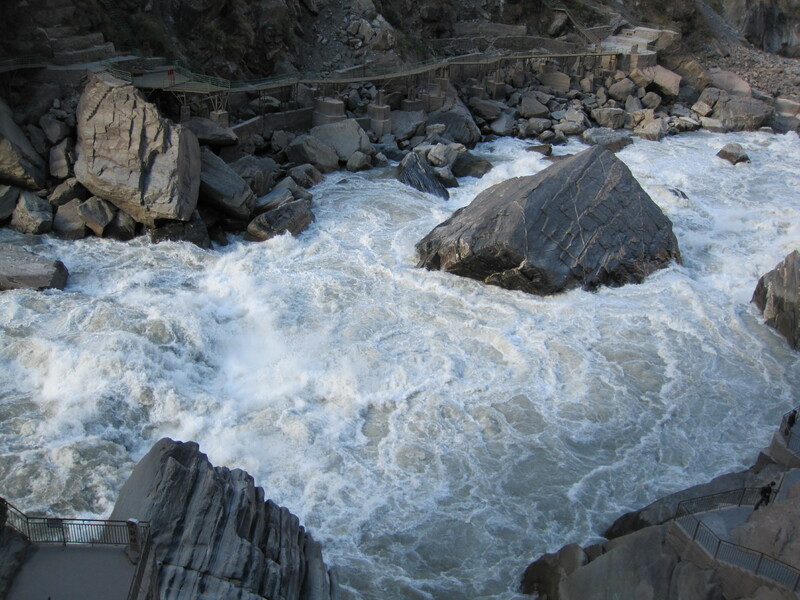 Apparently the massive construction resulted in so much stone falling into the waters below that the very currents were altered, making it safer for the passing ships. 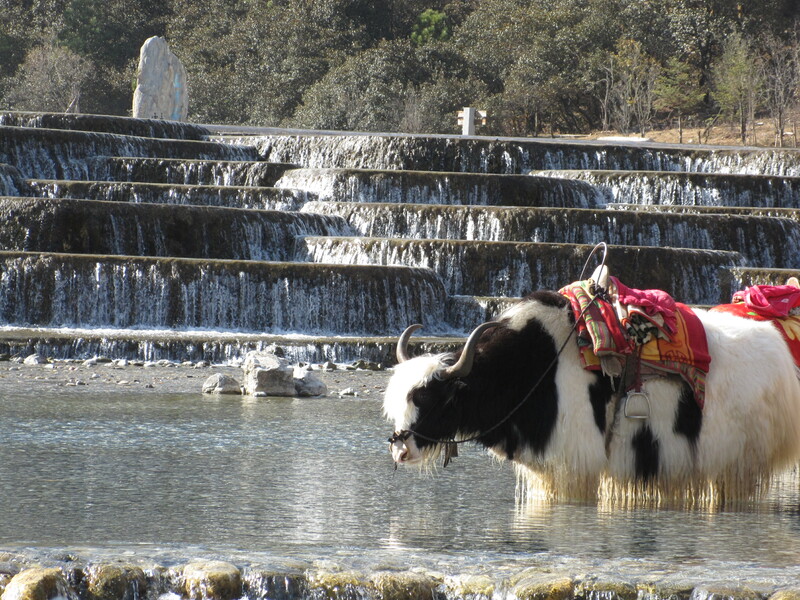 The next day, we took a plane from the Chengdu airport to Lijiang in China’s Yunnan province. 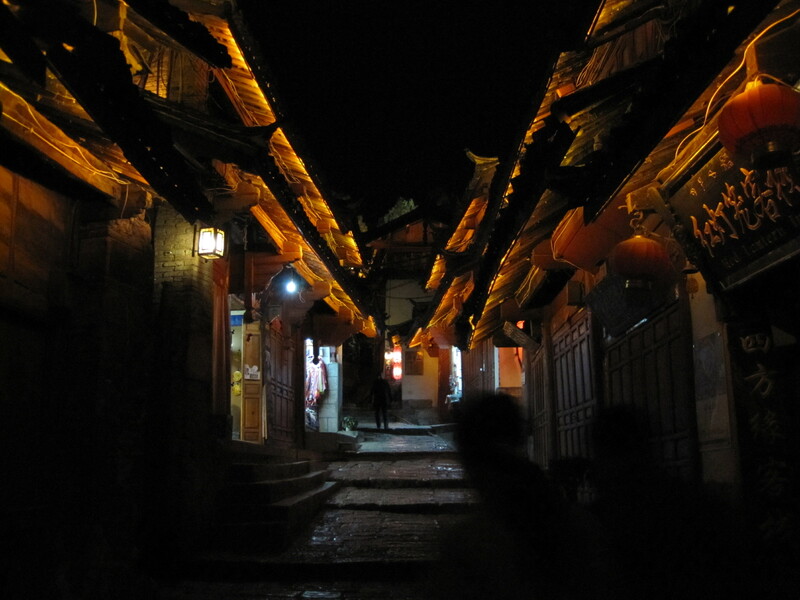 We arrived at night, and took a bus from the airport to the edge of the Ancient Town of Lijiang. 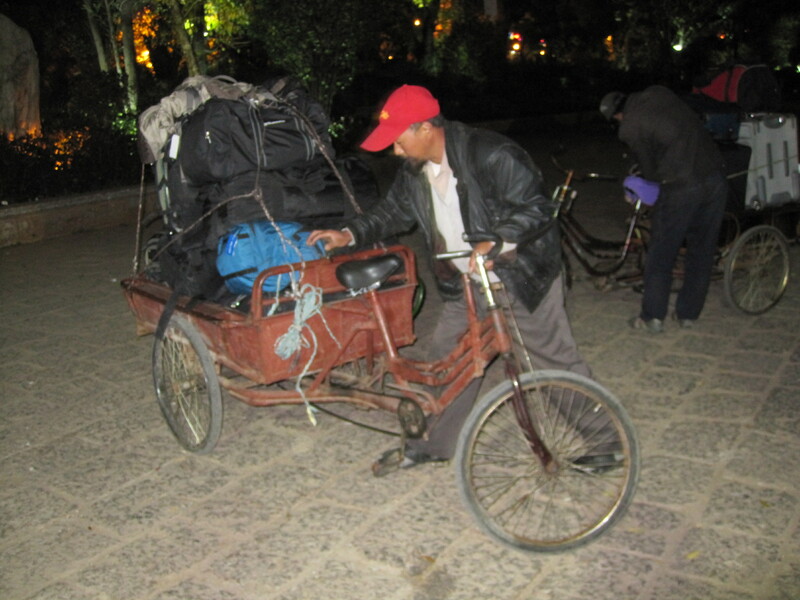 Peddlers came out to greet the bus, loaded up our bags, and led us into what was the most unbelievable place I have ever been. That night it was hard to see and I didn’t fully comprehend what the town was. 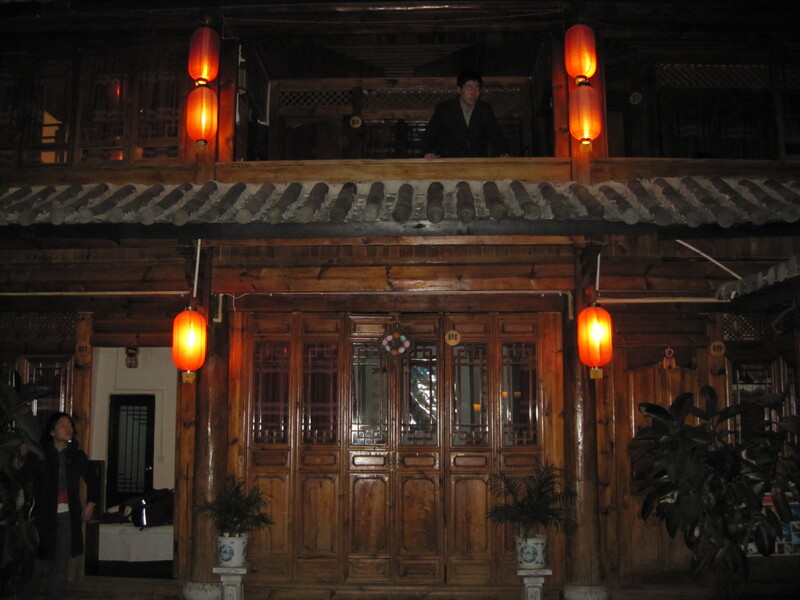 I remember walking through the winding cobbled streets to finally arrive at our hotel–gorgeously fashioned as a traditional Chinese courtyard home. Since our group was so big, we were split between two nearby hotels. That night we walked around a bit, but were exhausted and soon went to bed. The next morning, with light streaming in through the curtains, I could start to appreciate the splendor of our completely wooden hotel. 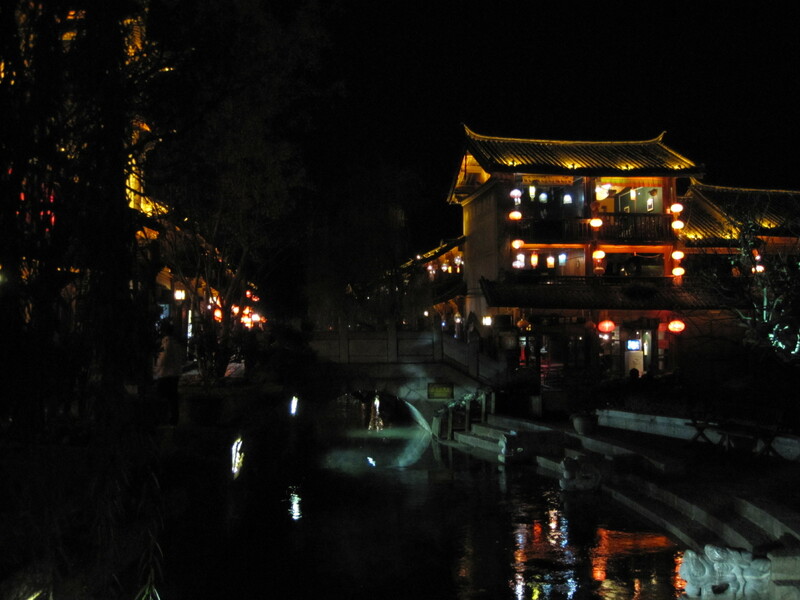 I soon realized that our hotel was not alone; in Lijiang striking oriental architecture and ancient structures are ubiquitous. Every other town I had been in my life had at most one street, maybe even one district that remained (or resembled) intact from its historic beginnings. 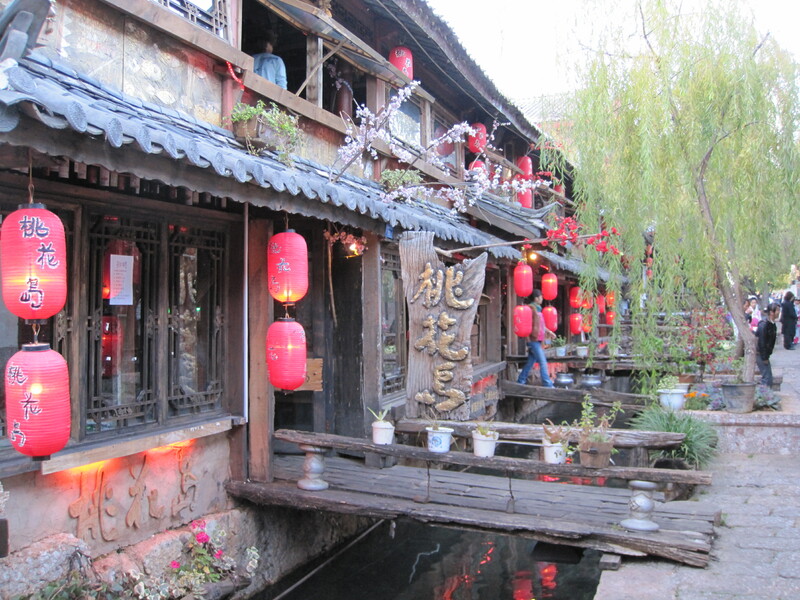 Lijiang was unlike anything I had ever seen before; it is an entire ancient city—literally. 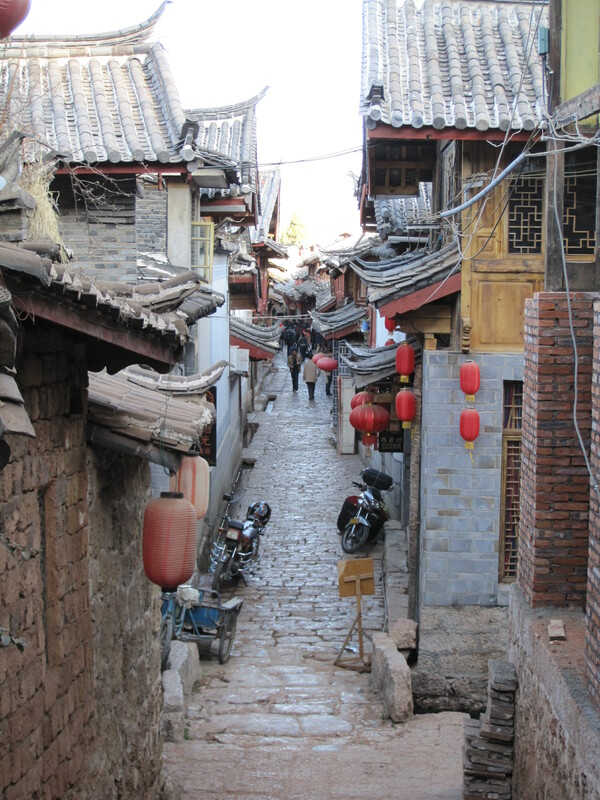 Every single building is made of all wood; every street and path is made of original cobble stones and rivers and bridges over them can be seen everywhere in town. 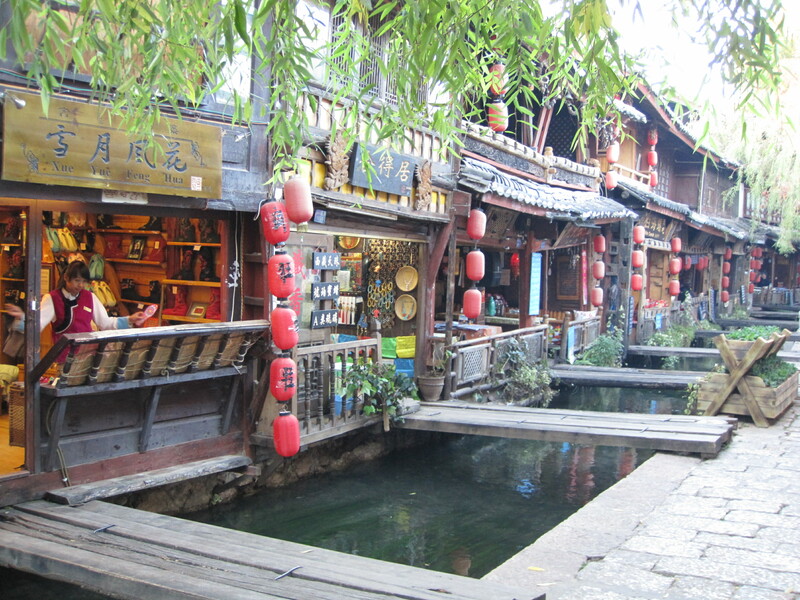 Planks of wood beckon patrons to cross trickling waters into ornate shops boasting bone carvings or painted scrolls. 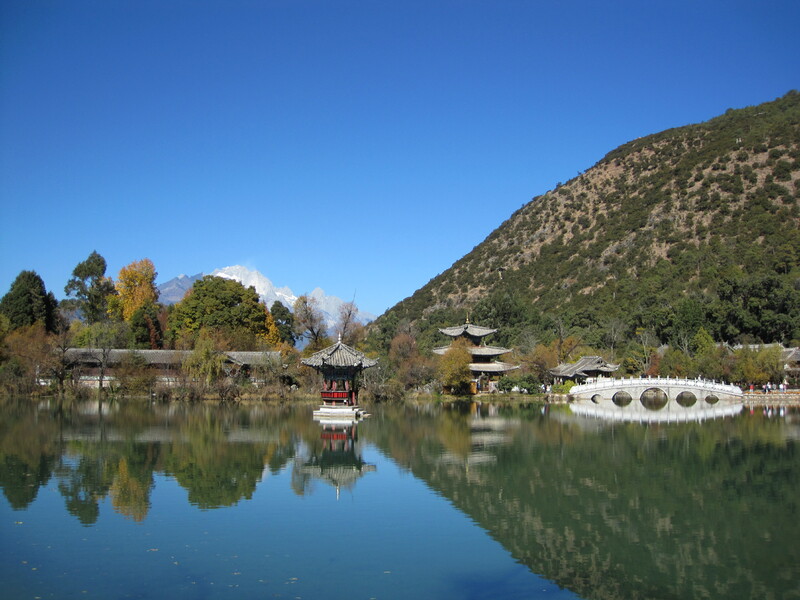 Lijiang is truly a hidden gem; although it is very tourist-oriented, the tourists are not international but mostly from within China. 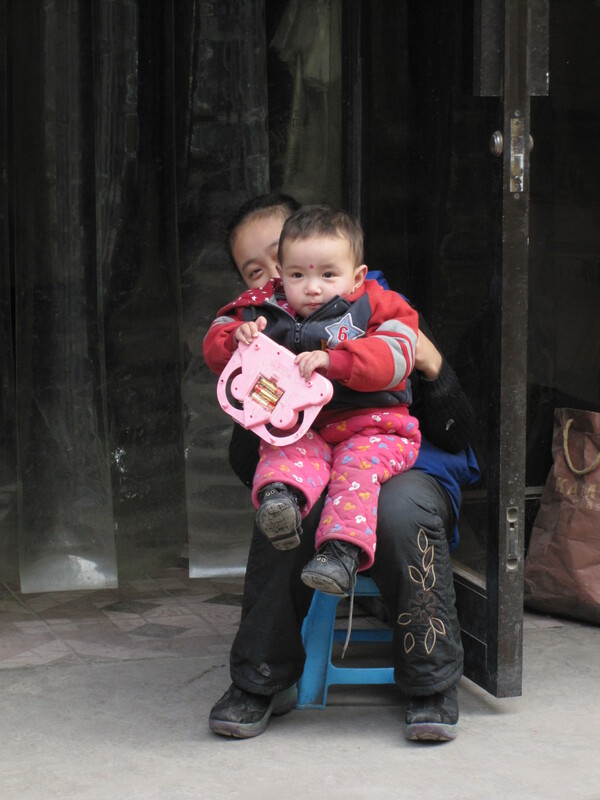 The people are also the friendliest I had encountered during my time in China. 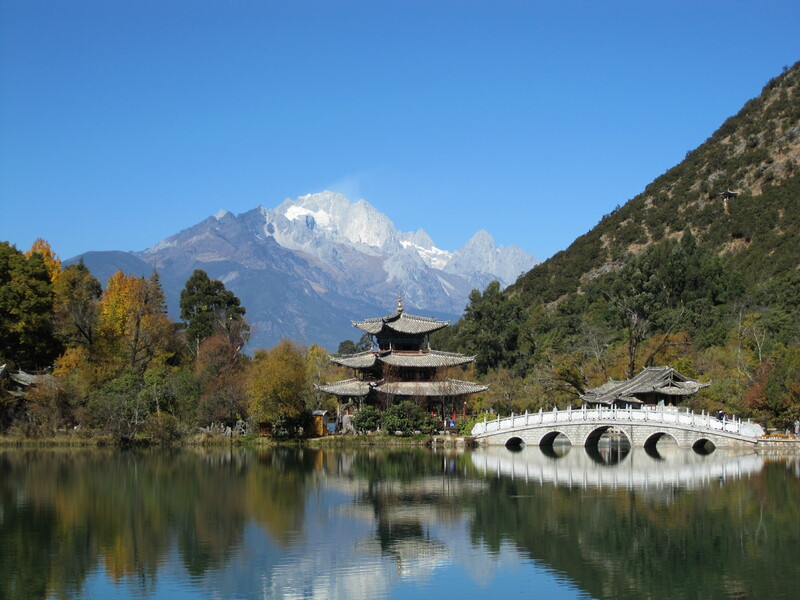 Lijiang is said to have an ethereal power over the people who come to it; it is not uncommon to discover from people that you talk to that they visited, felt drawn to the place, moved here and have been here ever since. 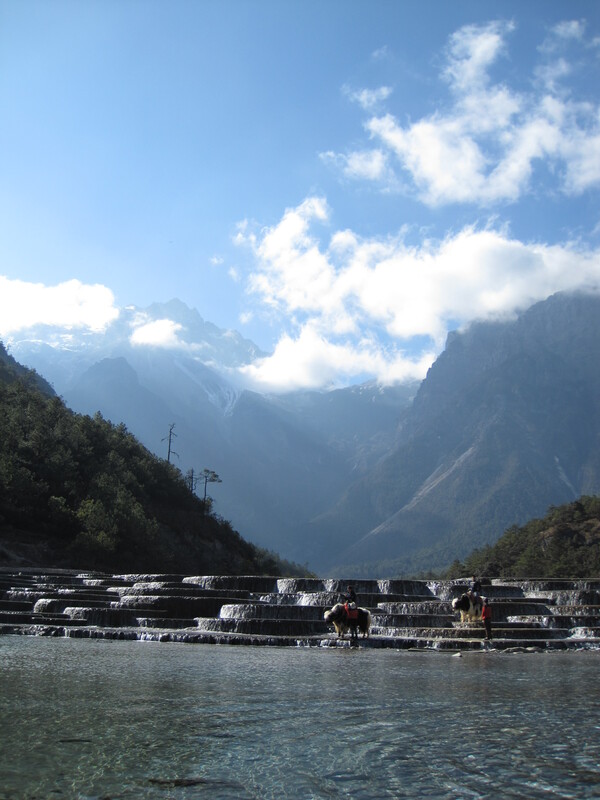 It is said that here, worries of money and worldly inhibitions fade away. 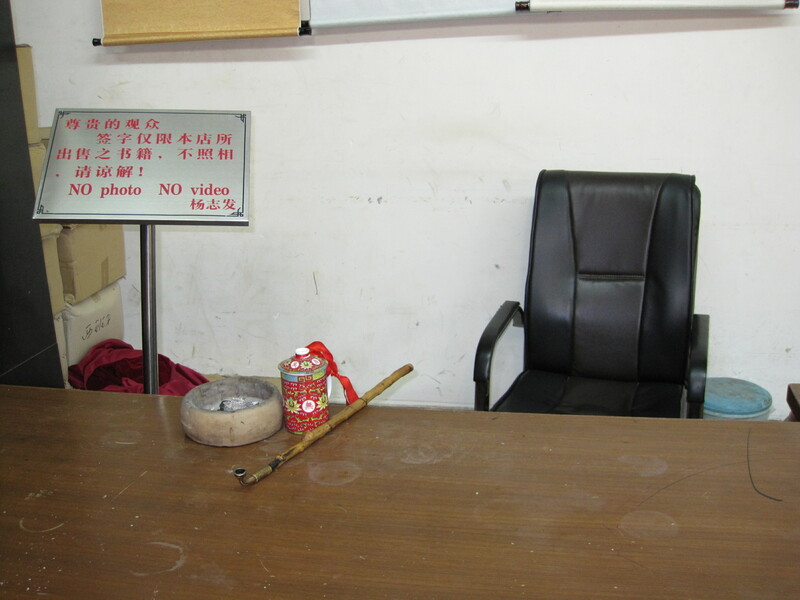 Even our teacher from Peking University who accompanied us on our trip said that he would love to retire here. 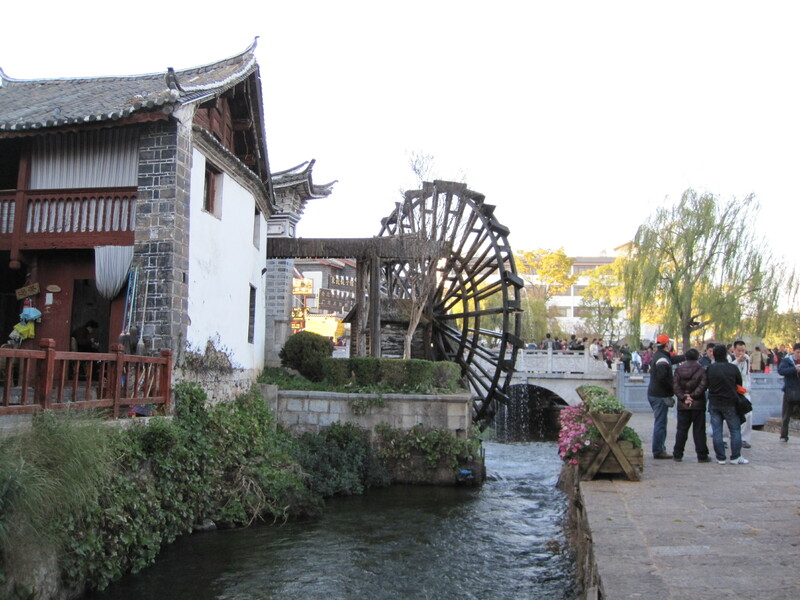 The town used to be a confluence of trade along the old tea horse road. 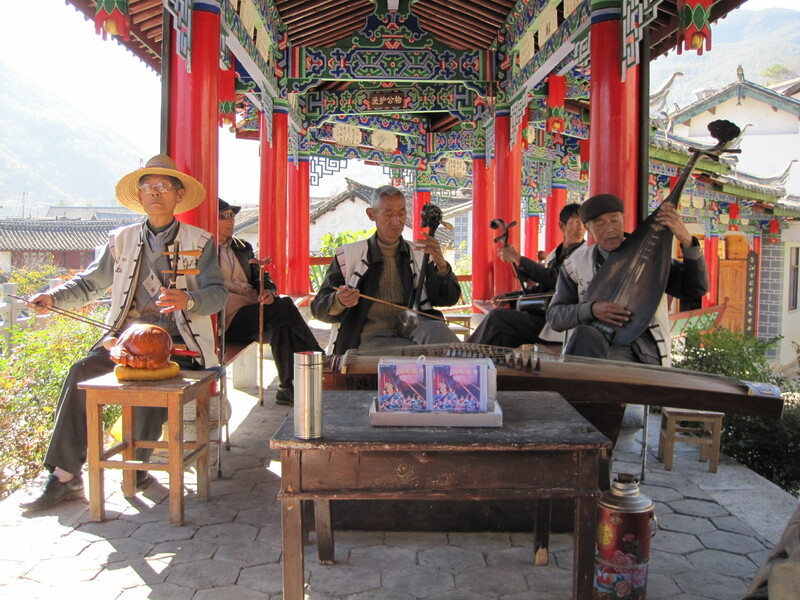 It’s traditional residents and culture are evident in every aspect of the city’s life today—the Naxi people are deeply ingrained in the identity of the city and are the object of great interest to many tourists. The friendly people and inexhaustible appeal the town seems to offer around every corner results in a perfect opportunity to explore. One day I stumbled upon a doorway which caught my eye. A paint can hung above with a blue handprint on it. After closer inspection, I looked within the entry way and saw paint and all types of crafts hanging from the walls. The door was wide open and, having grown accustomed to the almost overwhelming hospitality which pervades the city, I walked in. As I entered, an expansive room opened before me with large paintings on display along the walls, augmented by bright lights hanging from the ceilings. On the far side of the room a man, with his back to me, slouched in a large leather chair facing a large painting, a cigarette dangling between his fingers. Disguised by the tranquil music that filled the room, I walked along the studio to admire the various pieces. He eventually noticed me, and we exchanged a few words before he asked me to sit down. We talked for awhile and towards the end of our conversation I asked what he was doing tonight. 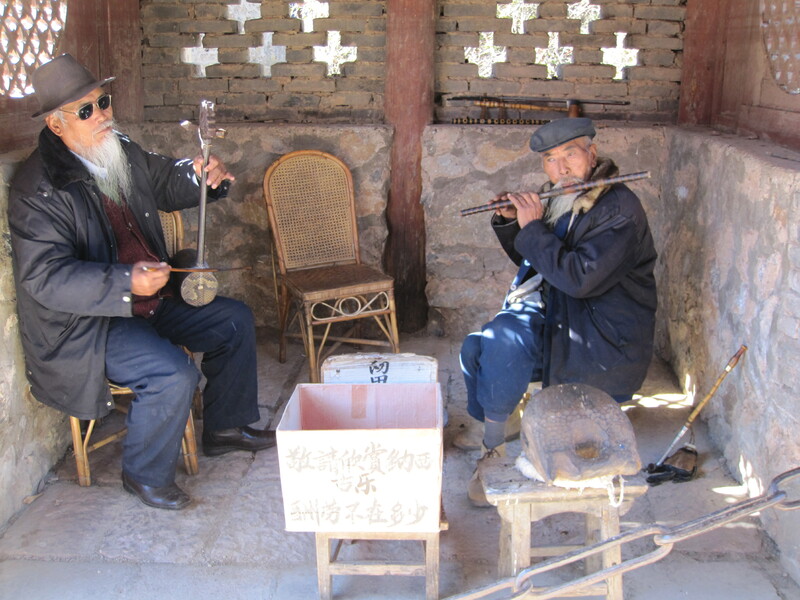 He replied that he would do what he does every night, drink Baijiu (Chinese vodka) and paint. I asked if it would be alright if I came back later that evening and he said yes. With two beers in hand, I returned that night and met one of his students (more like apprentice) who hangs out there and learns from him. 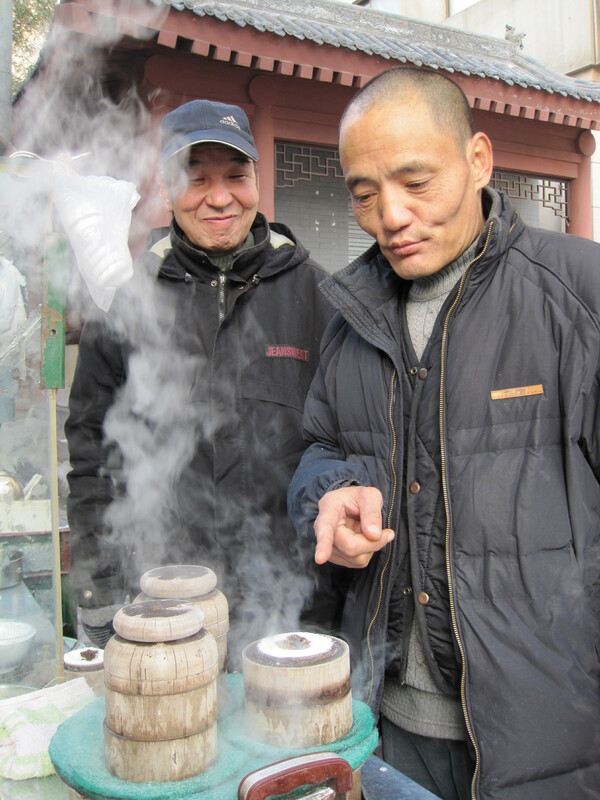 We all drank Baijiu together and watched an artistic movie the artist made with his friends. From then on, I stopped in once a day to say hi to the artist and his student on my way into town. 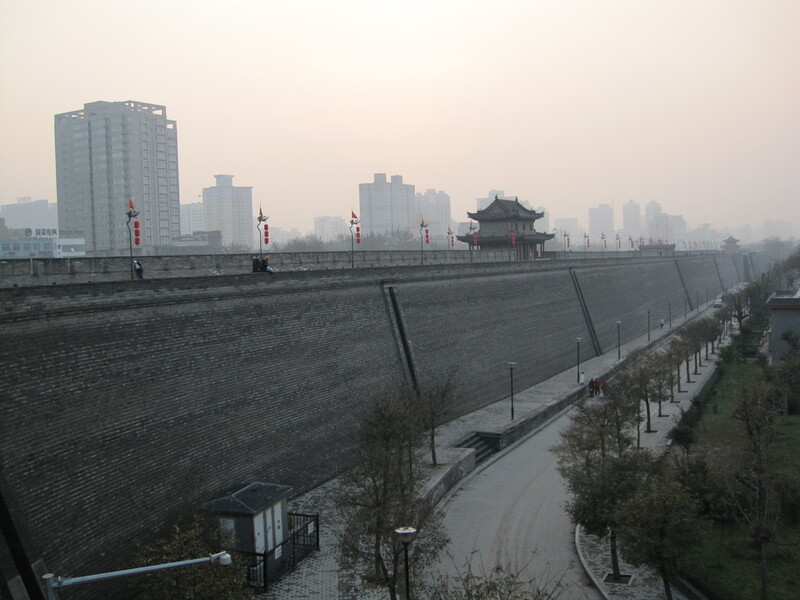 On the way back to our hotel we stopped to walk along Xi’an’s ancient city wall, which was surprisingly massive. That night we went to a specialty restaurant that served what my teacher touted as the best 饺子(jiao zi)—dumplings—he has ever had. They were each prepared beautifully and in the fashion of what was inside. 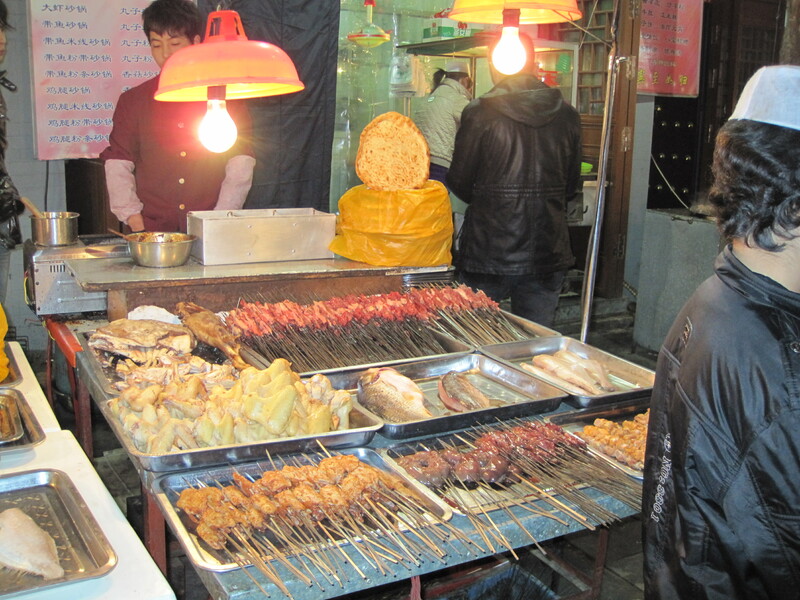 After dinner we walked the area’s busy night market street which was teeming with life. 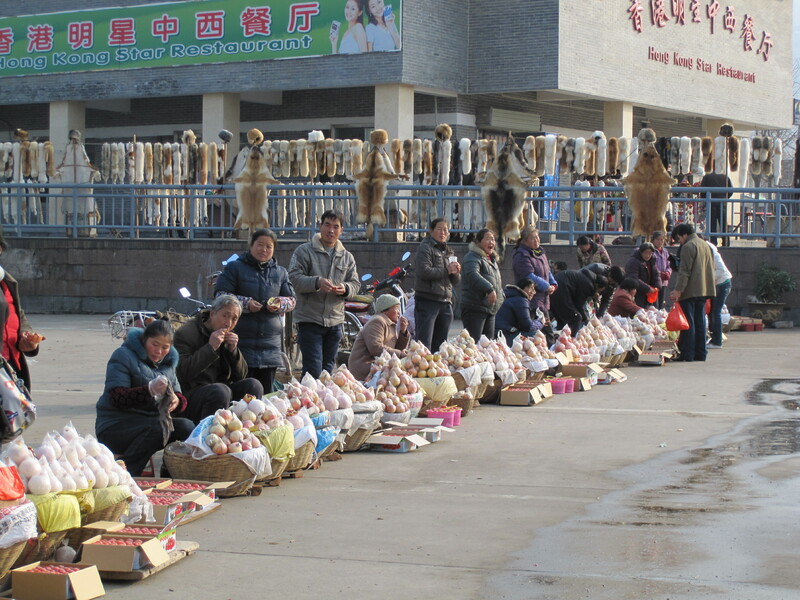 Vendors of all types lined the cobbled road along both sides and in the middle, gesticulating wildly in an attempt to sell their merchandize or food. 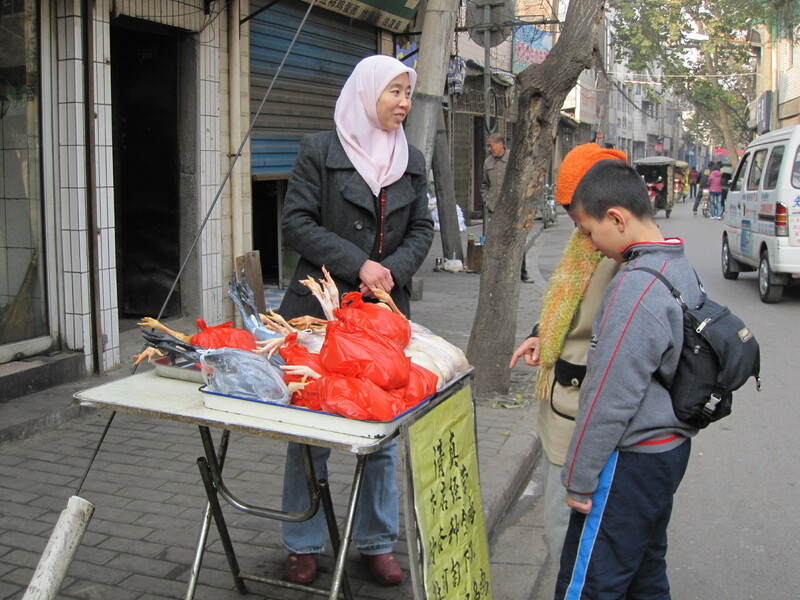 The next day we went to Xi’ans Muslim quarter to visit the Xi’an’s Great Mosque. It was right outside the mosque that I bought a small black sword from a vendor. 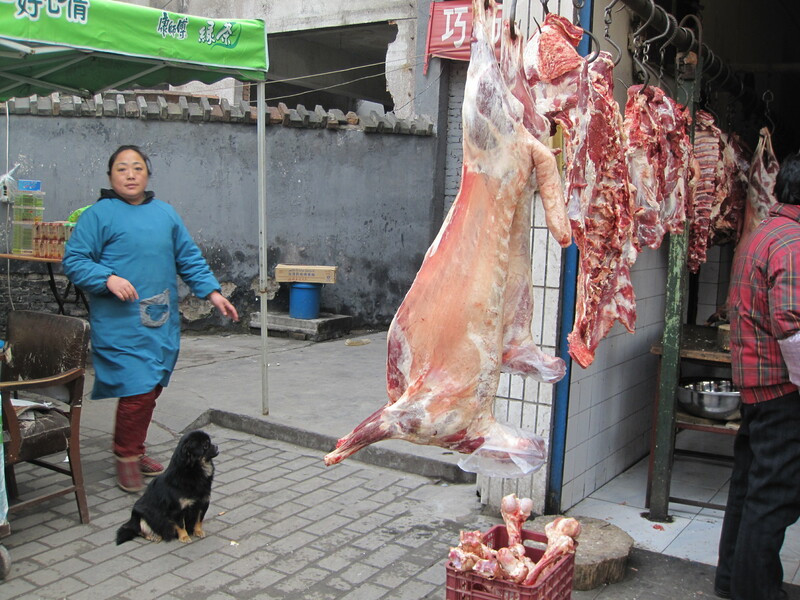 Tony, Pierre, and I walked around the Muslim quarter (Xi’an has a large Muslim population–all ethnically Chinese) with while the azan (or Muslim call to prayer) echoed throughout the crowded streets. 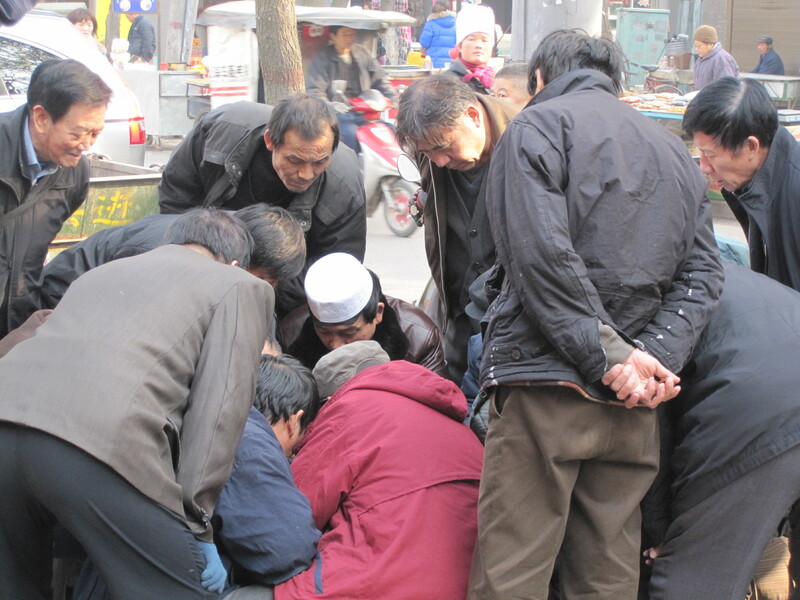 I have never seen such a lively and interesting cityscape—every corner was packed with meat sellers, noodle or tea shops, or locals enthralled in a Chinese poker game. 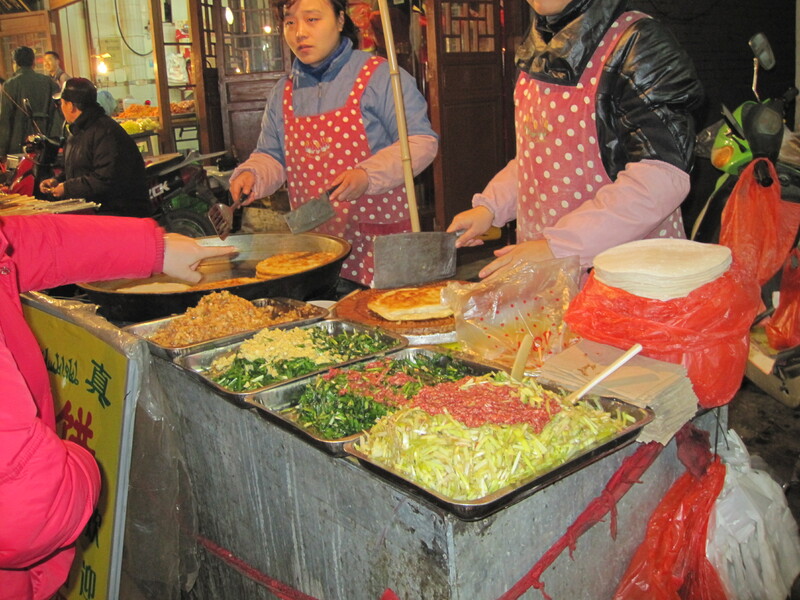 After a few hours of walking around what was a fascinating and incomparably lively neighborhood, we had Xi’an’s famous dish for dinner—Yang Rou Pao Mo. 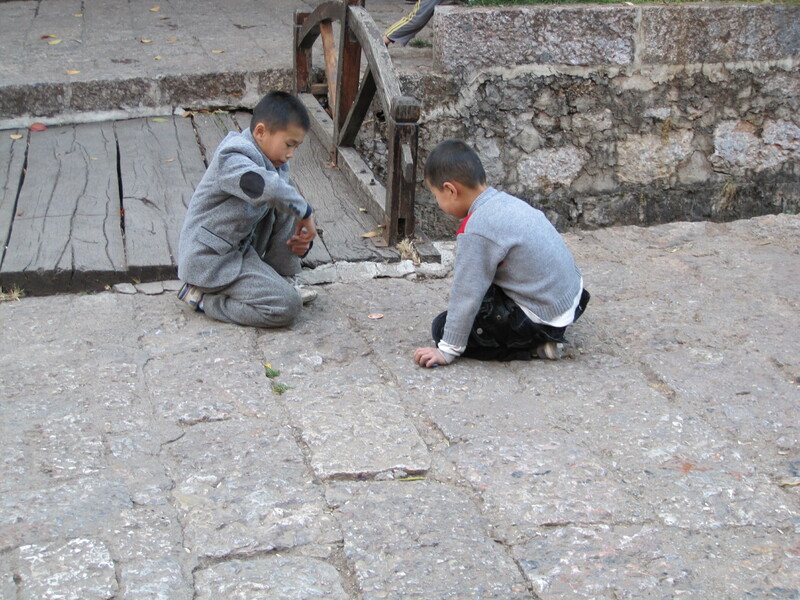 Tradition demanded that we first grind up rolls of bread with our fingers into tiny pieces into our own bowls. After twenty minutes of twisting and pinching, the waitress came around and took our bread-filled bowls and returned them to us now filled with a special broth and spices. To be honest, I didn’t quite see what all the hype was about and why this dish was revered as Xi’an’s best, although it was still a great experience. 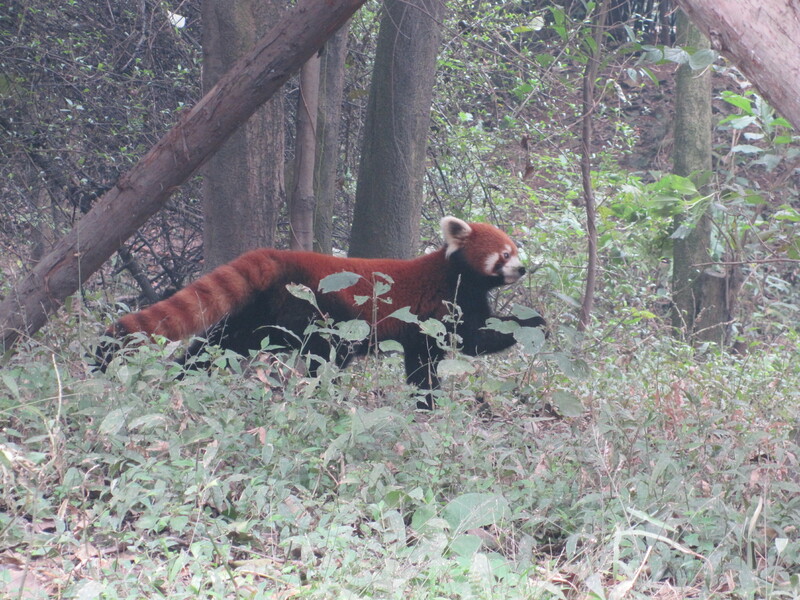 That night, we took a plane to Chengdu—the capital of Sichuan province—where we visited the well-known Chengdu Panda Breeding and Research Center the next day. 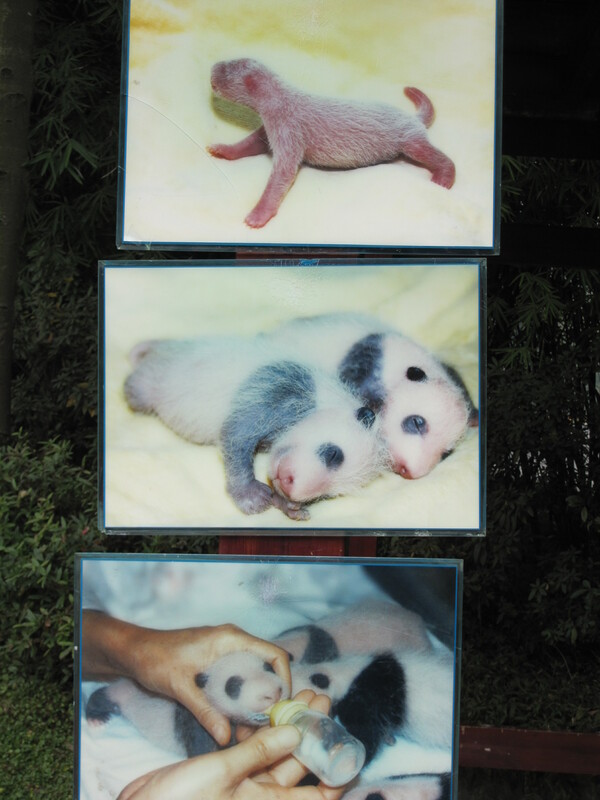 The extensive Center has a theatre in which a documentary plays describing the lives of the Pandas and what absorbs the researchers every day. 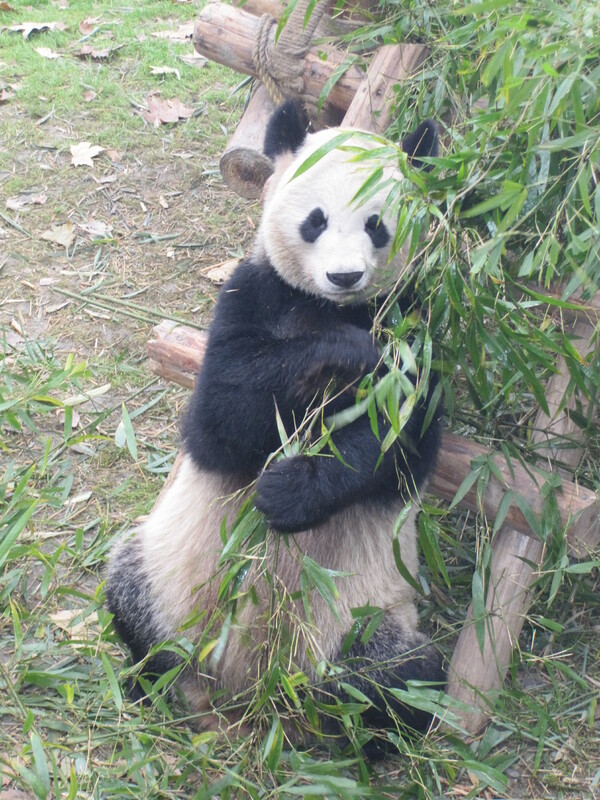 They manage all the pandas on behalf of China–leasing out Pandas to other zoo’s around the world. 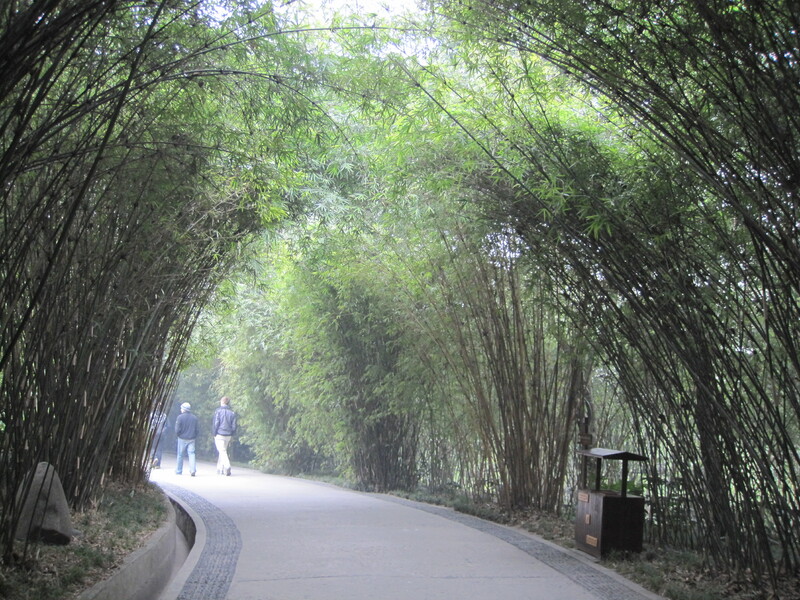 The facility covers 92 acres of natural habitat for all sorts of endangered animals—Giant pandas, lesser pandas, black-necked cranes, and white storks to name a few. 1. 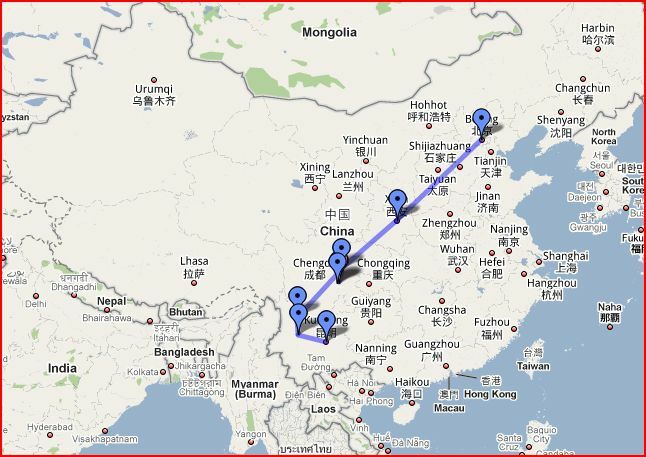 The coastal, “Economic” trip which visited Shanghai, Hangzhou, Suzhou, Shengzhen, and Hong Kong. 2. 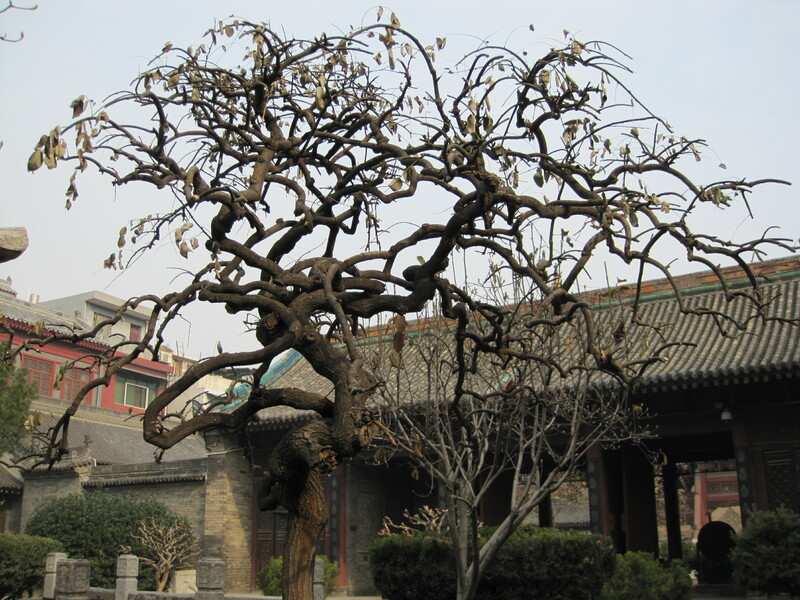 The “History and Culture” trip which went to Luoyang (to the famous Shaolin Monastery where monks practice Shaolin Kung Fu), Xi’an, Chengdu, and Guilin. 3. 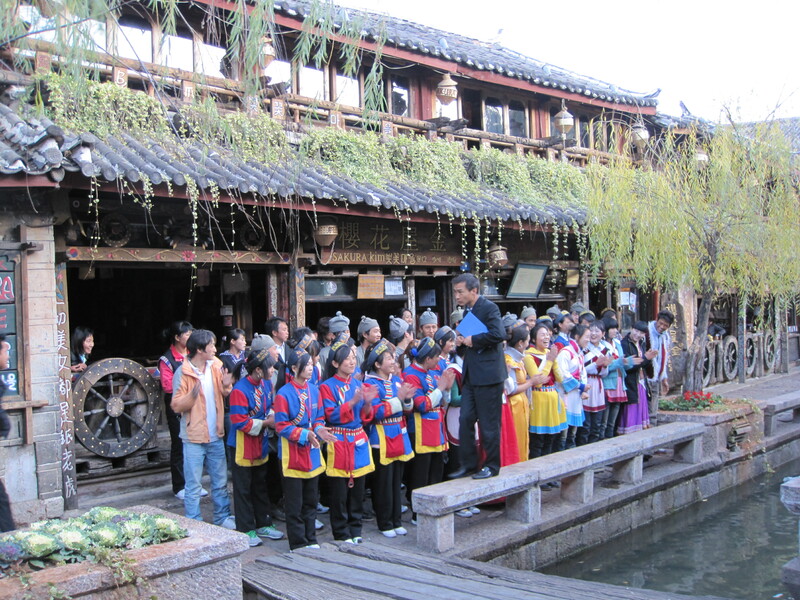 The “Ethnic Minorities” trip included touring Xi’an, Chengdu, Leshan, Lijiang, Dali, and Kunming. I, along with 50 of my classmates opted to go on the third, “ethnic minorities,” trip making it the most popular among the 90 or so students in our program. 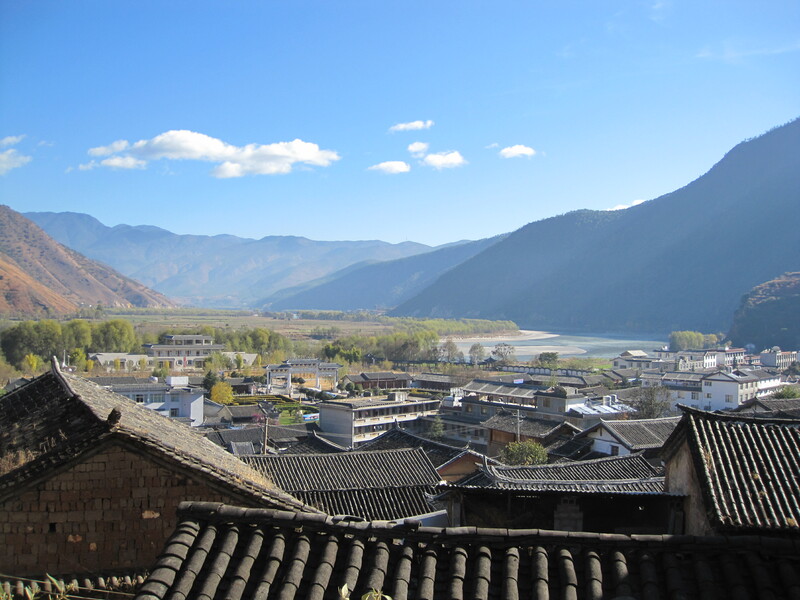 As seen below, we traveled to the south western part of China through the country’s Yunnan and Sichuan provinces, renowned for their spicy cuisine. 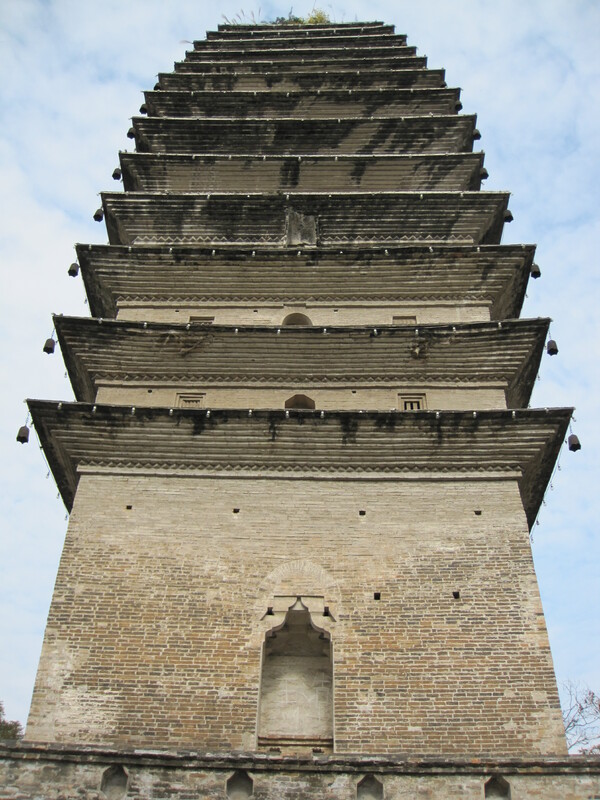 Our journey began as we boarded a sleeper train in Beijing in the late afternoon and headed out through the night for Xi’an. My friend Tony and I shared a small compartment with four other Chinese. Each compartment consisted of three beds on either side, stacked upon one another. We bunked on the top, and spent most of the night making conversation with our bunkmates who were all going to Xi’an to visit family. 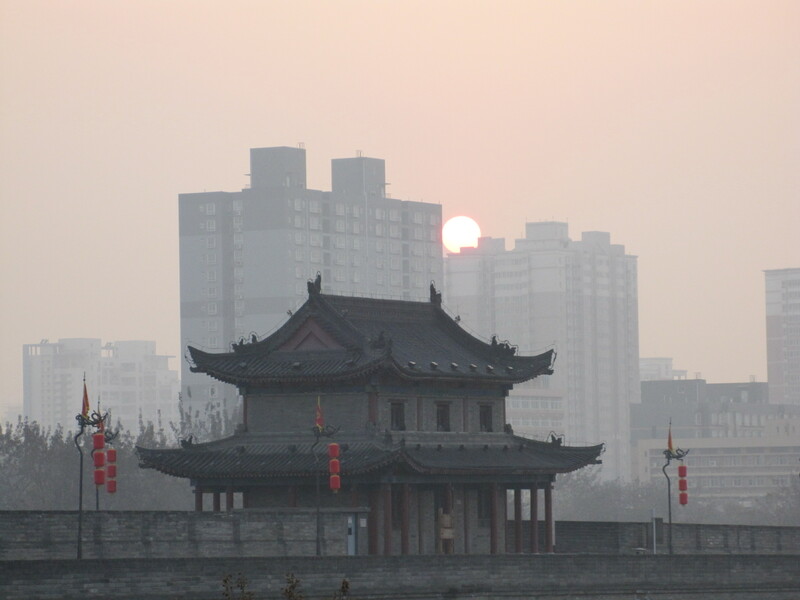 I was startled from my sleep at 8 in the morning from the train’s whistle signifying our impending arrival in Xi’an. 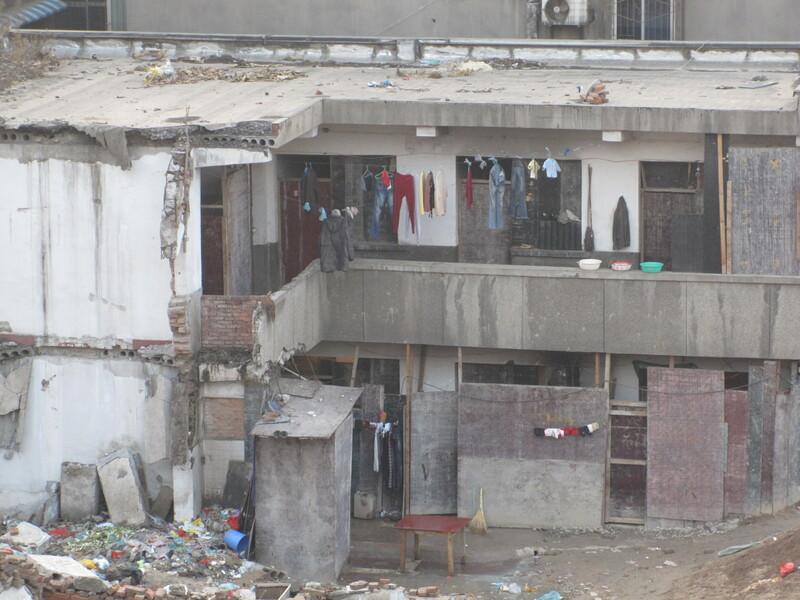 I climbed down from my rickety bunk as the train slowed to a stop. Stepping off the train we found ourselves swept up in a crowd of Chinese who all seemed to be lugging rice sacks or other large bags on their backs. After walking to our nearby hotel to drop off our own bags, we headed off to go see the greatest archeological discovery of the 20th century—the Terracotta Warriors. 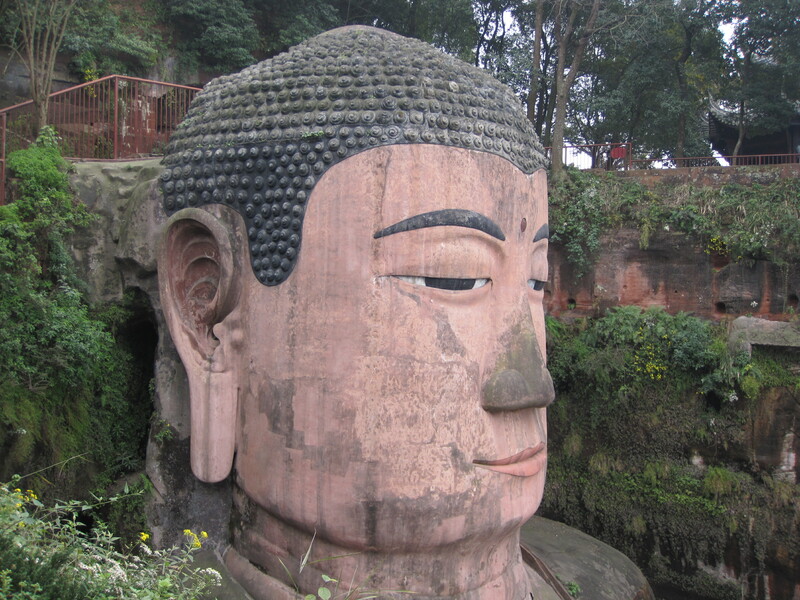 On March 29th, 1974, a local Chinese farmer was digging a well and stumbled upon a large clay statuette. When he brought it to someone to find out exactly what it was, they told him it was over two thousand years old. 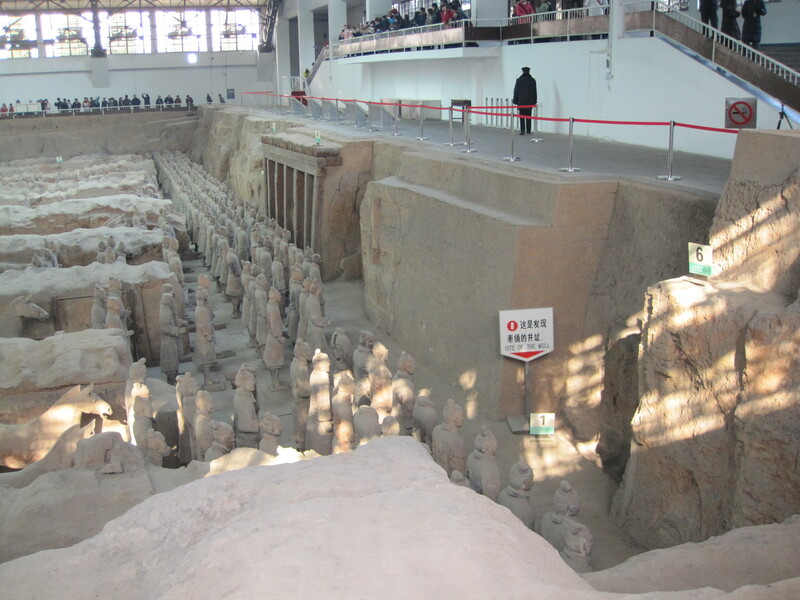 What the farmer had discovered was the life-sized, Terracotta Army which was buried over 2,200 years before with China’s first emperor—Qin Shihuangdi. 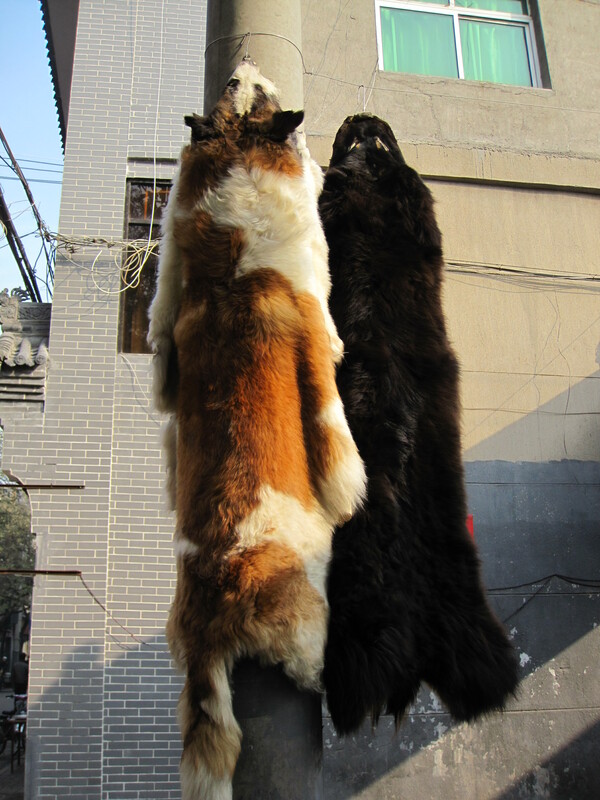 We first entered the site through its museum which explains the history and nature of the extensive burial site. This was honestly one of the most unbelievable human creations I have ever seen in my life, rivaling even the Great Wall. 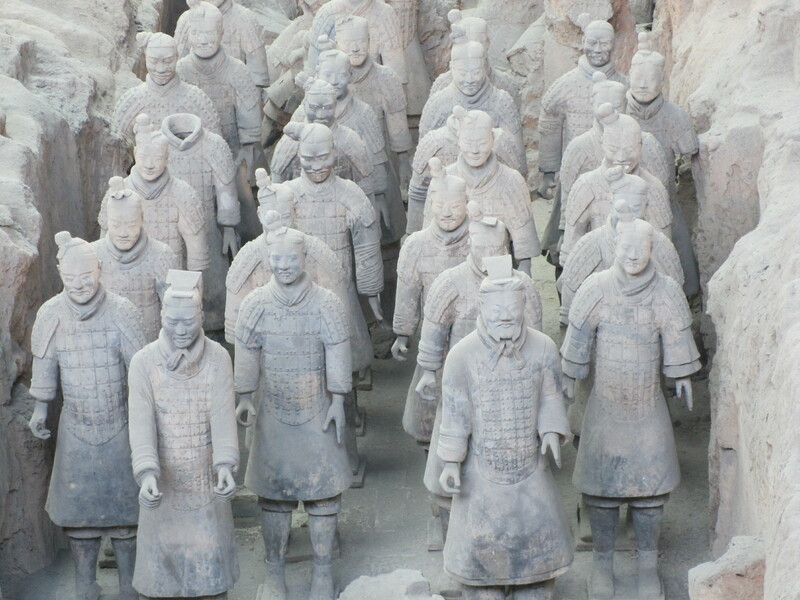 While only a portion has been excavated, there are an estimated 8,000 life-sized soldiers all of whom have different clothes, heights, faces, expressions, and hair styles. They were all painted and were equipped with bronze weaponry (including swords, crossbows, spears etc…) though the weapons were stolen by robbers shortly after their creation and the oxidation (as a result of being unearthed) has destroyed the color. 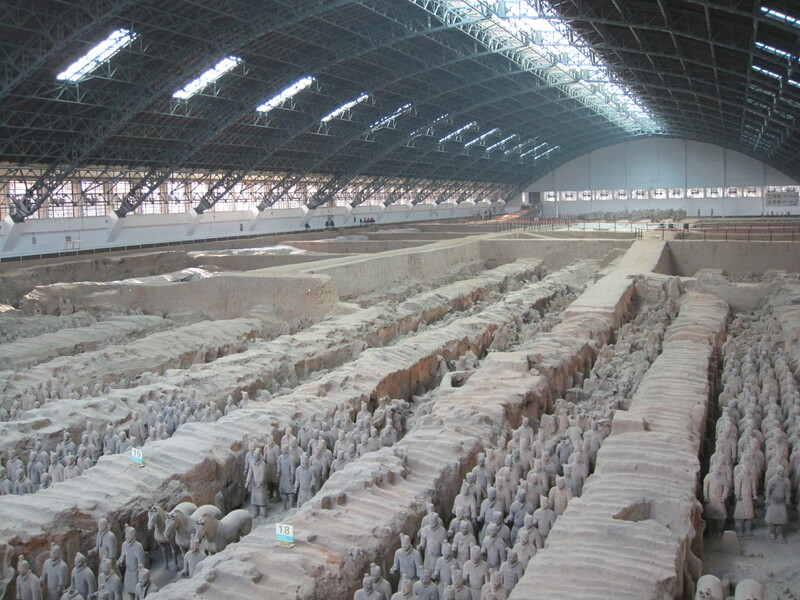 Also buried (and life-sized) are another 130 chariots with 520 horses and 150 cavalry horses. Each sculpture has intricate details such as harnesses for the horses and ties in their hair. 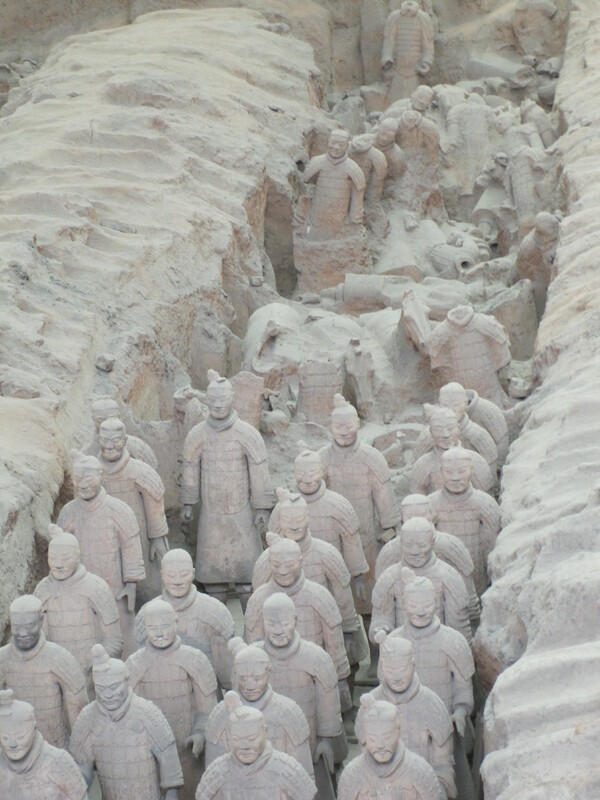 This army was created to protect the first emperor of China in the afterlife, and is still only a part of his profligate mausoleum which he started building when only 13 years old. The army not only consisted of full regiments organized according to rank and formation, but countless auxiliary pits including an armor pit (made in the same fashion and size as real armor) and various stable pits some in which real horses were buried alive. 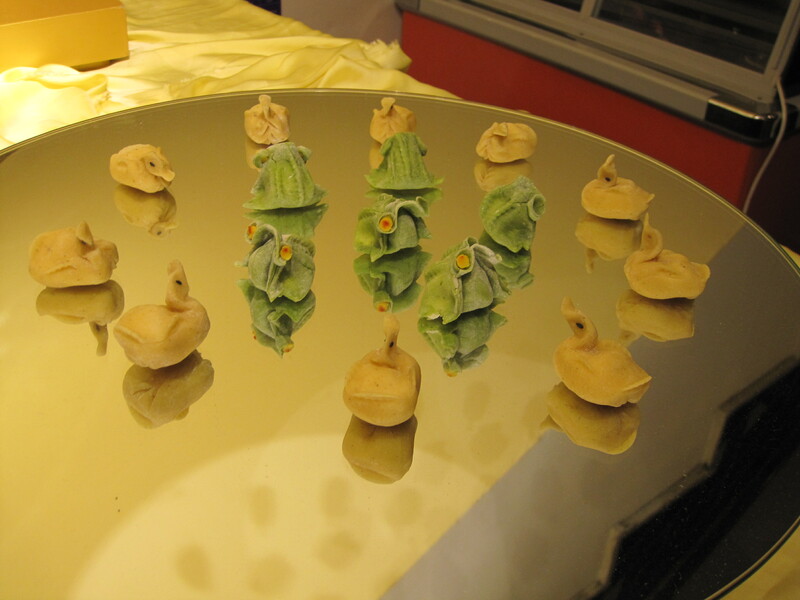 There are even clay sculptures made of all the different types of birds known to the empire at the time. All of this was intentionally buried under a wooden roof which has since collapsed over the centuries. As excessive as this seems, this was only the defending force for the emperor in the afterlife. 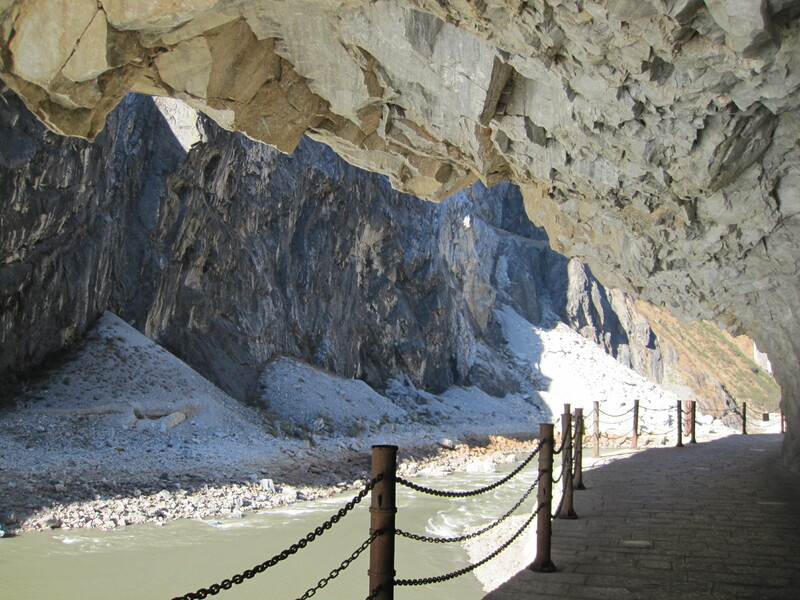 His main mausoleum is 1.5 km west of the excavated terracotta warriors and is sealed underground among rivers of mercury. 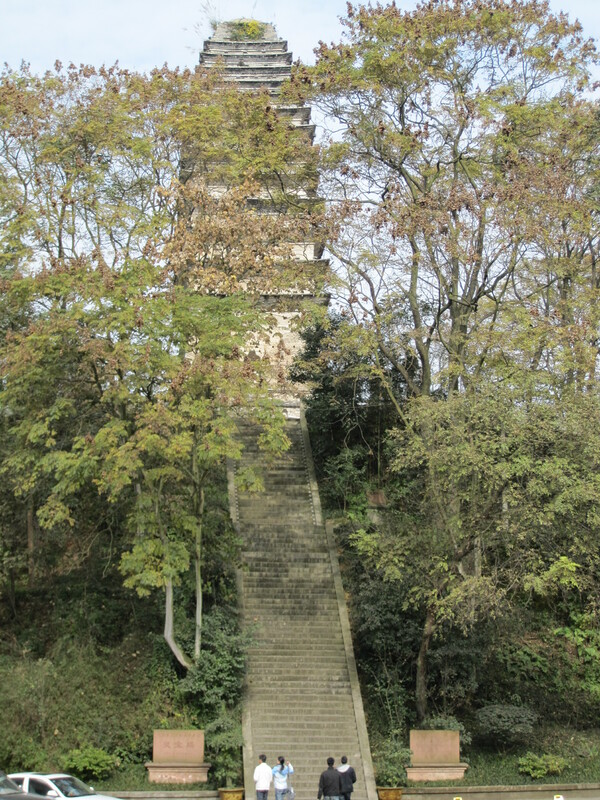 It is believed that the construction of his necropolis involved 700,000 workers. Today (as is stated in the museum) the main burial chamber remains untouched because the government wants to wait until we have the technology to avoid damage due to oxidation in order to better maintain the treasures that will be found. 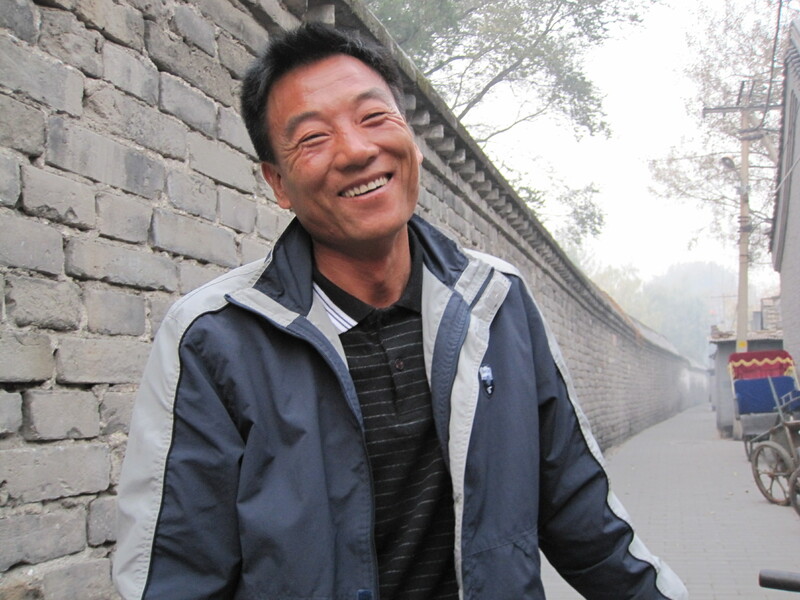 This man, Yang Zhi Fa, was the farmer who discovered it all when building a well. 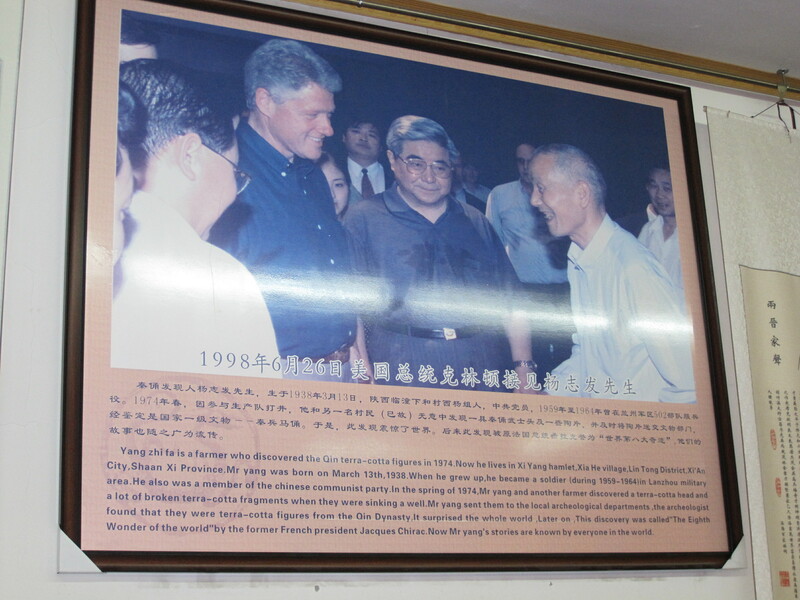 Not surprisingly, he has become a celebrity of sorts and is pictured here meeting Bill Clinton. 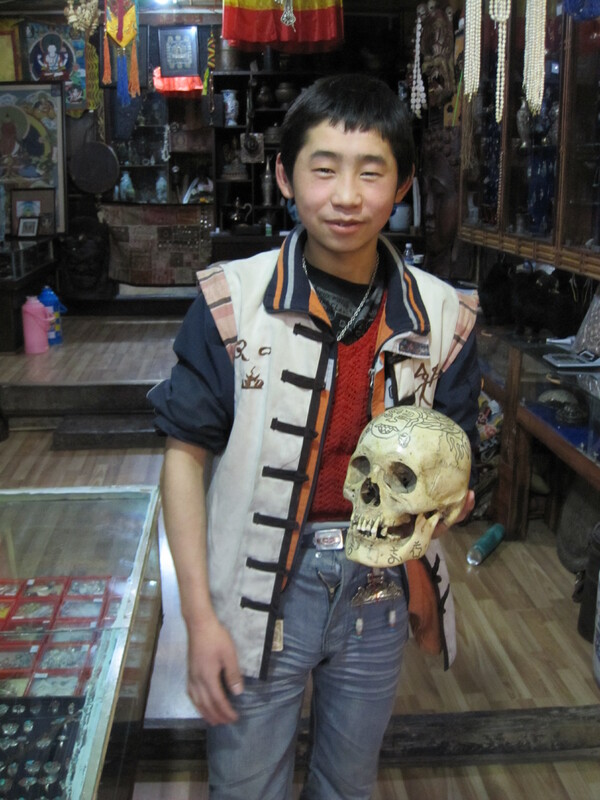 He comes into the museum almost every day and visitors can take a picture with him for a 100 Yuan ($16). We went to see him but we had just missed him. 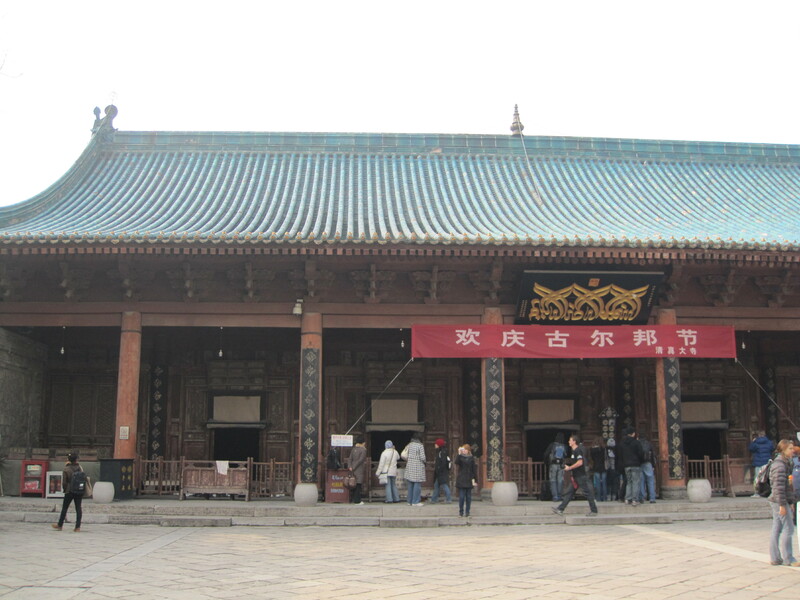 The museum consists of many exhibits, and is adjacent to the three large pits which house the excavated and non-excavated portions of the Terracotta Army. While the unearthed warriors are impressive in their own right, it was the extent and extravagance of the mausoleum as a whole which makes this accomplishment of the ancient world truly remarkable. In the last week of my internship, Ms. Lu, Carbon Capital Management’s CEO, invited me and the other intern out to dinner along with our boss whom we had worked under all semester, Lisa. One night, we met at the office and waited for Ms. Lu to arrive. A large SUV pulled up and we all got inside, only Ms. Lu was not driving. She was bundled up in the back seat in a big white coat as her driver navigated through the Beijing traffic on the way to the restaurant. I had met Ms. Lu in passing once or twice before, but we never exchanged more than a few words. As we drove along, she asked about our experience as interns and told us how she appreciated our work. 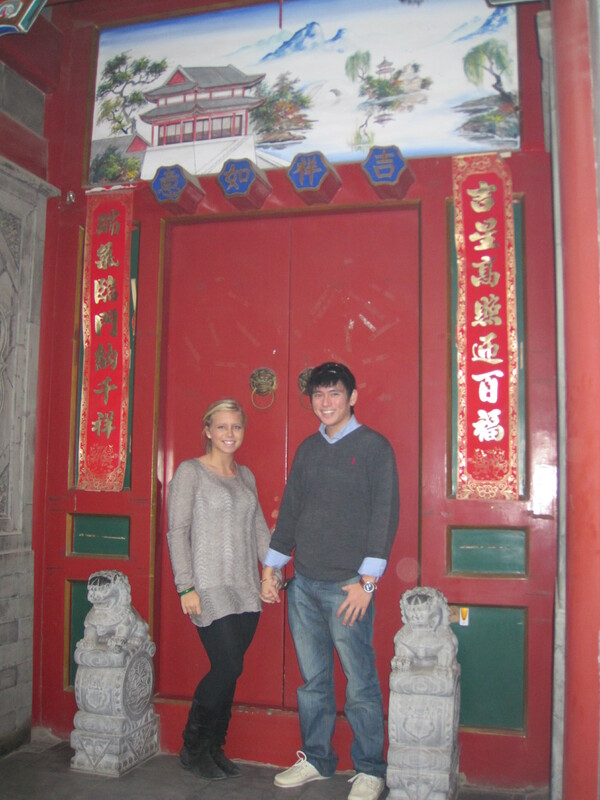 We pulled up to an ornate Peking Duck restaurant where we were led into our own private room. Ms. Lu, who founded the company, is fluent in Japanese and Chinese but cannot speak English. So, with Lisa’s help, we talked about our experience at the company and Ms. Lu’s interesting past. A native Chinese, Ms. Lu always had a knack for entrepreneurship and started three companies by the time she had graduated college including a bakery and a clothing store. She told us how hard it was to start a company with no credibility. She told us a story about how she was frustrated that no one feared her and that they weren’t showing a sense of urgency when she told them to do something because she was young and physically a small woman. She was so fed up that one day she fired every employee but one, on the spot. She said that after that, her employees were scared by the mere sound of her footsteps. Halfway through the meal, we were joined by her driver and “the Japanese expert” whom the driver had since picked up at the airport. He was a seasoned Japanese consultant probably in his mid 50’s and had become good friends with Ms. Lu, visiting once a month as a close business partner. He could speak English quite well although couldn’t speak much Chinese. Relying heavily on Lisa for translation—as only person who could speak Chinese and English fluently—we talked about the qualms of learning a new language and the funny differences between cultures. As a kid from Boston sitting at that table with a Japanese consultant on one side, and an international entrepreneur on my other, it was an enlightening conversation that only reinforced a sentiment that I find permeates Beijing and those within it—China is the land of opportunity. 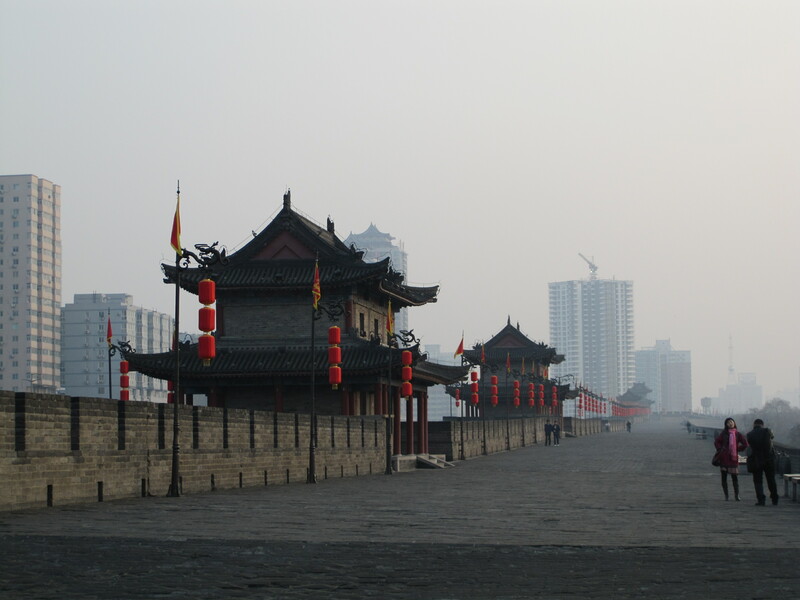 On Saturday morning, Cait and I took a taxi deep into the capital, to the south of the Forbidden City. 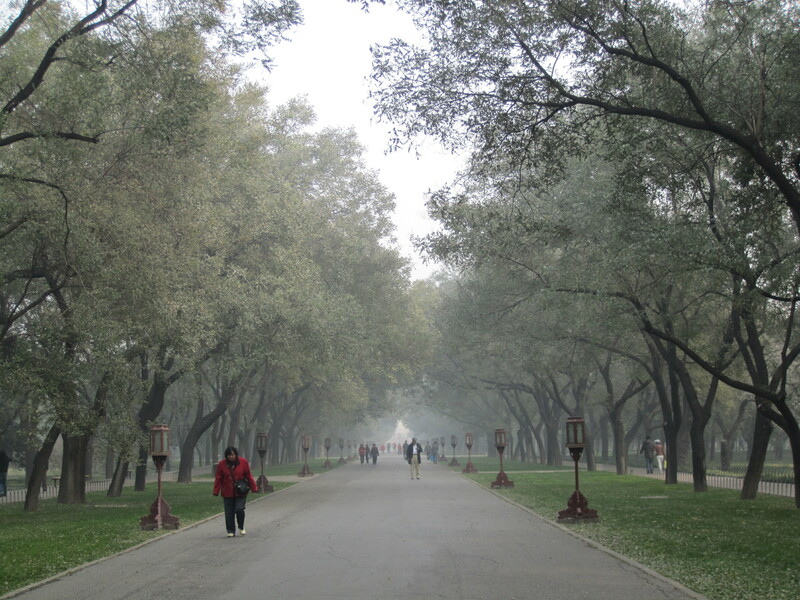 We entered the West Heaven Gate and proceeded to walk through the silence of a park draped in fog and filled with music from the surrounding speakers. 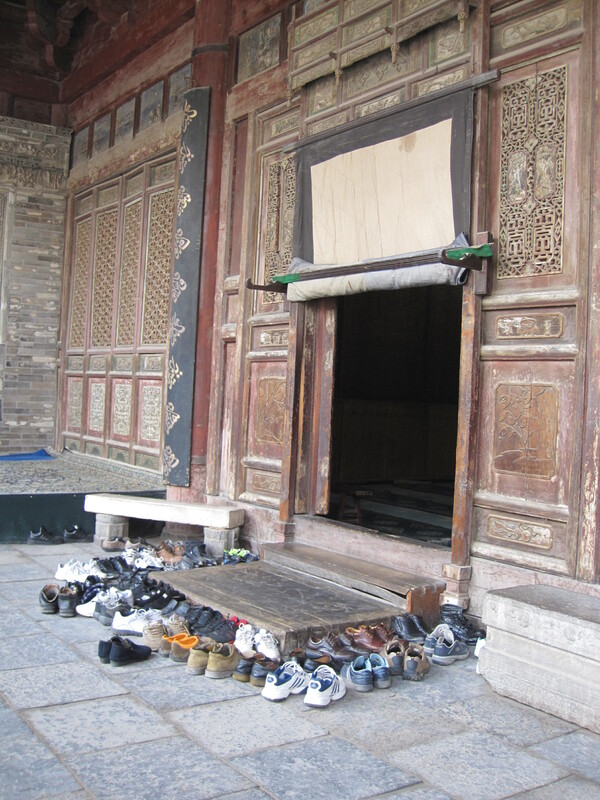 At the end of our walk we reached the ancient world’s manifested connection from heaven to earth—the Temple of Heaven. The Temple of Heaven was erected in 1420 by the Yongle Emperor of the Ming Dynasty, who also ordered the construction of the Temple of Earth in the north, Temple of Sun in the east, and Temple of Moon in the west. 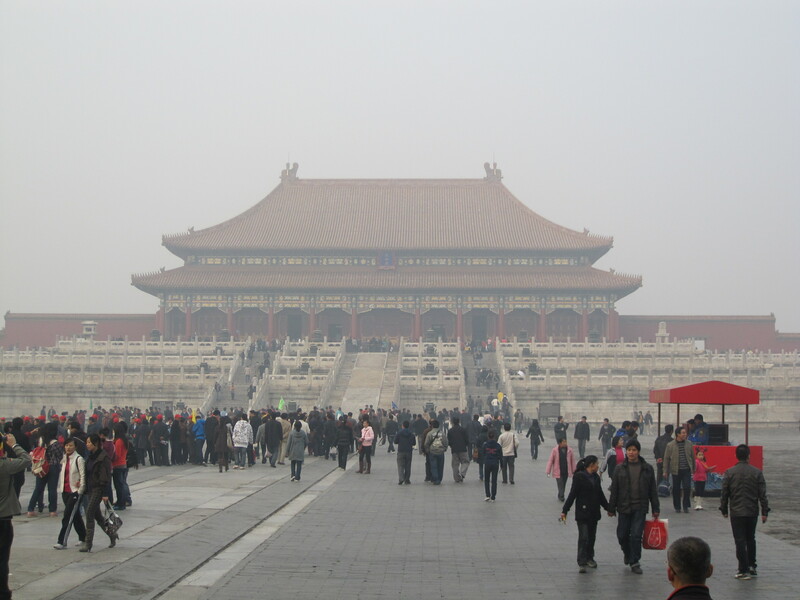 The emperor, or Son of Heaven, resided at the center of these four temples in the Forbidden City, organizing the Old Beijing according to feng shui, or the right alignment of objects with earth. 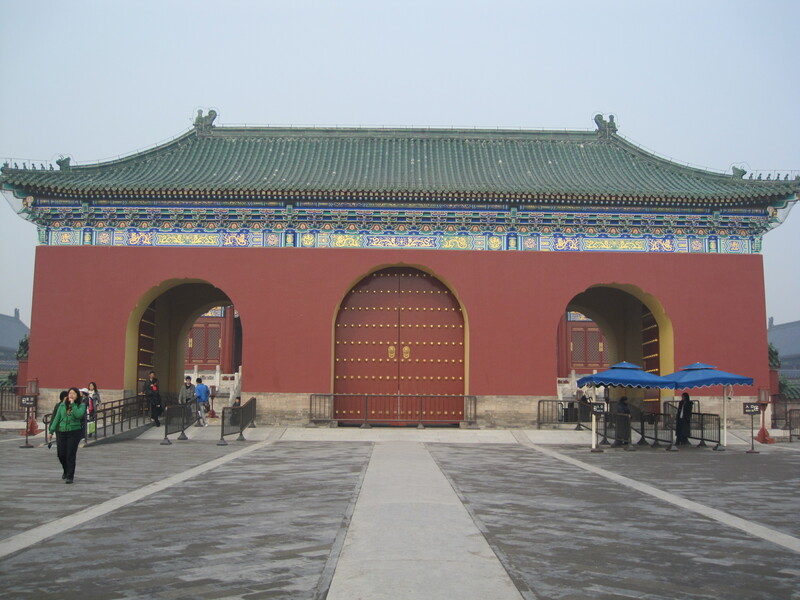 The Temple of Heaven, which also consists of the Imperial Vault of Heaven and the Circular Mound Altar, most commonly refers to the Hall of Prayer for Good Harvest, the three-layered circular building. 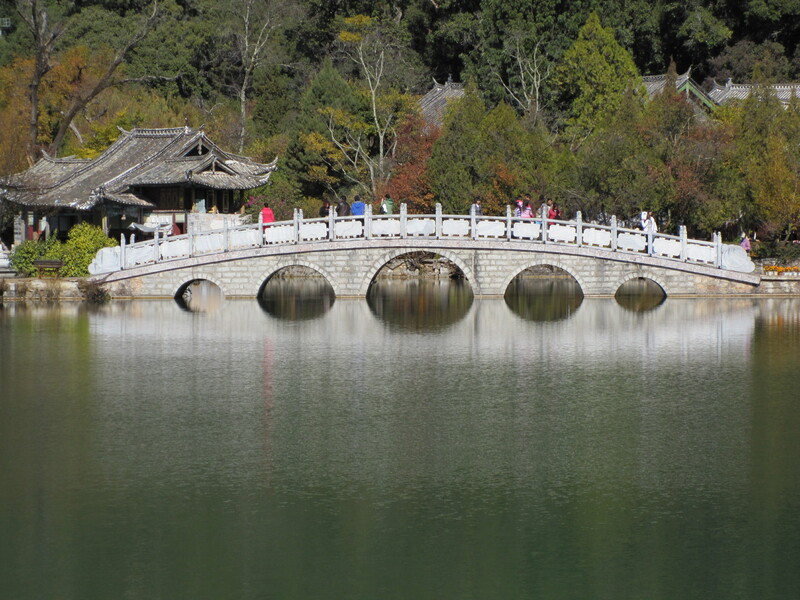 Within this Temple, Emperors throughout the Ming and Qing Dynasties would hold annual ceremonies of prayer to Heaven for good harvest. 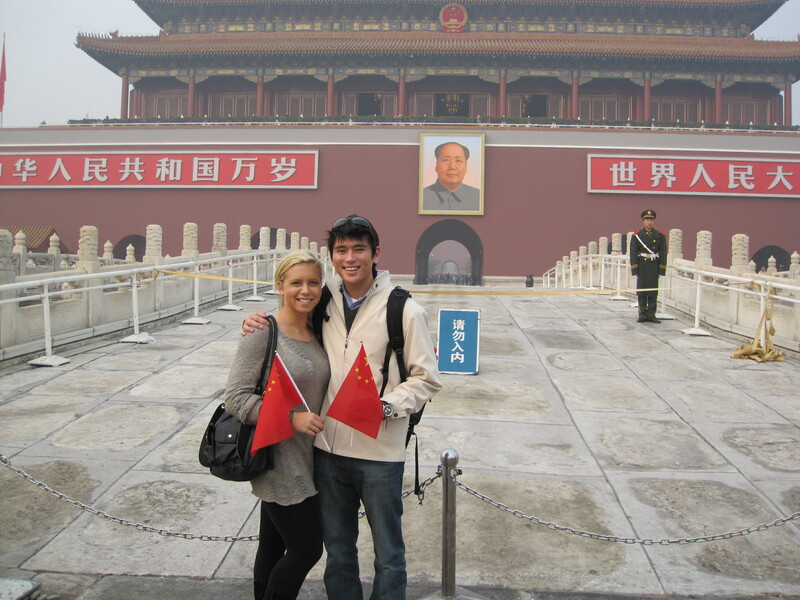 Next we walked through the world’s largest square, Tiananmen Square, on the way to the Forbidden City. 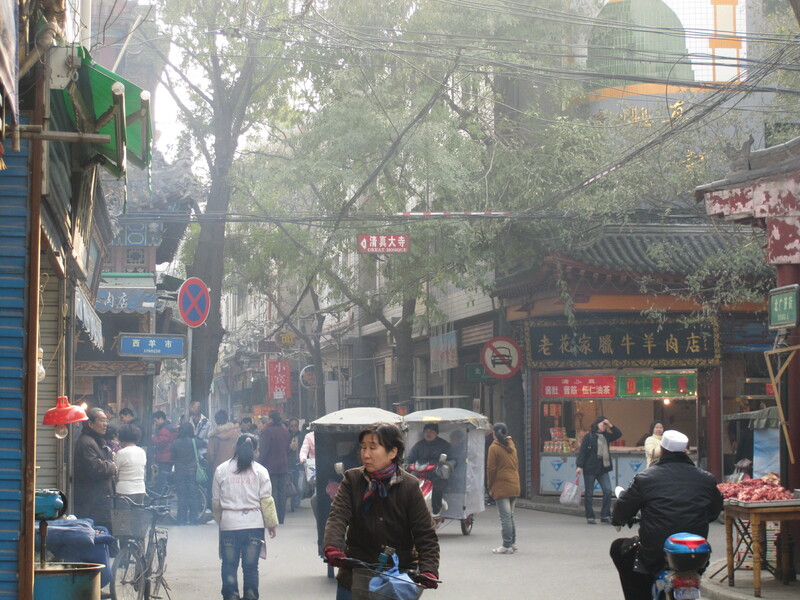 Our tour guide took us through the old hutong district showing us the new developments, and describing the significance and characteristics of the old courtyard homes. The doorway in which we are standing was of an extremely important military official. The officials’ homes generally had two main features depicting their function and stature. 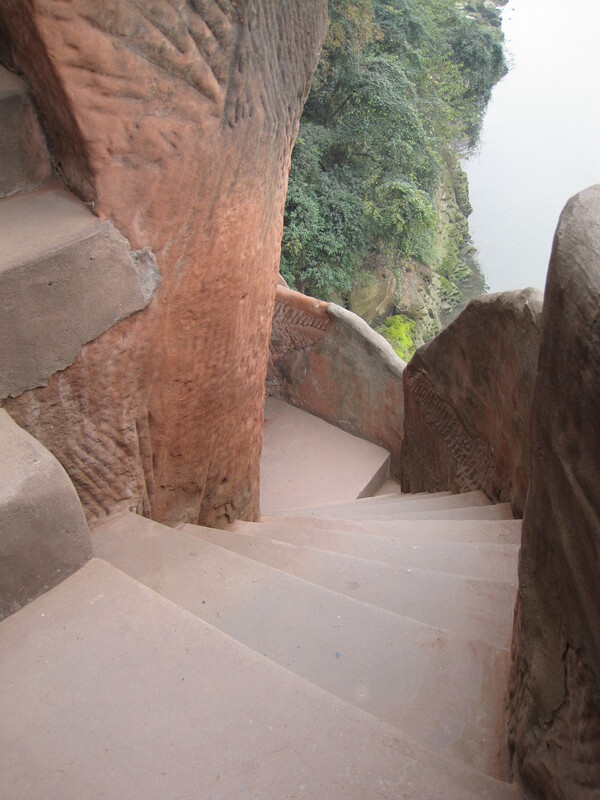 These were most readily exhibited by two stone carvings of lions on either side of the door, as well as wooden pegs above. As you can see above, the lions are atop round drums which signify that the person who lived here was a military official, versus a square which would signify a political official. Four pegs above the door, rather than 2, distinguished the official as of great importance. 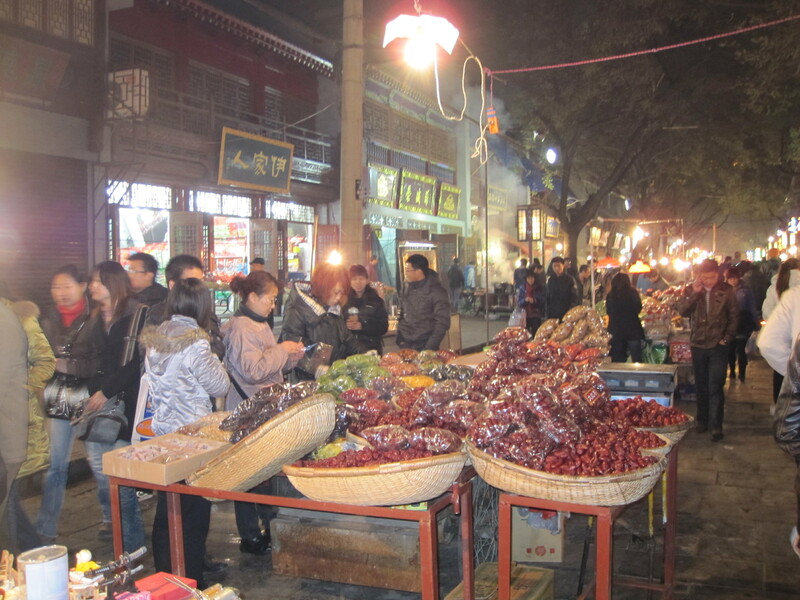 Although we had only a few days, we hit every must-see spot in Beijing and I even had time to bring her to the Worker’s Stadium area to show her Beijing’s clubs as well as the to the Silk Market. 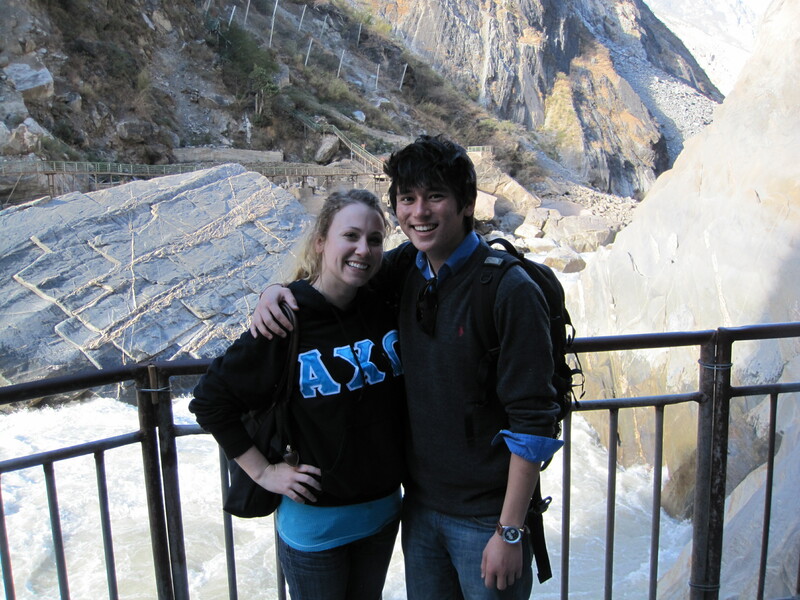 Showing her Beijing enabled me to see it again through new eyes and also made me realize how comfortable I had become with the country, culture, and way of life. 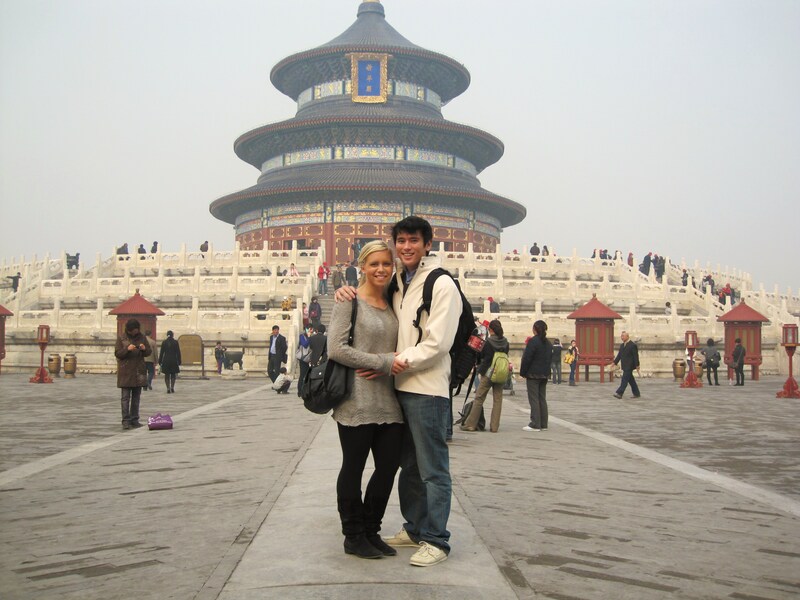 Welcome to my blog where I share my experiences living as a student in Beijing, China, attending classes at Peking University, and interning in a Chinese firm during the Fall of '09. Orient Express by John R. R. Howie is licensed under a Creative Commons Attribution-Noncommercial-No Derivative Works 3.0 United States License.